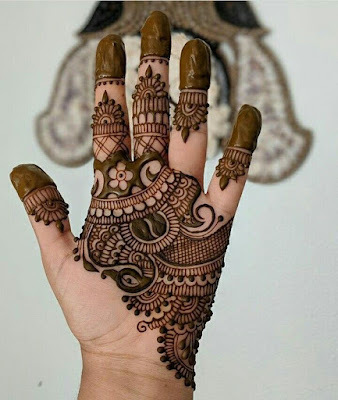 Mehndi is one of the oldest form of body art where dry leaves from henna shrub is powdered and made into a thick paste and then filled into plastic cones for ease of drawing beatiful and intricate mehndi patterns. 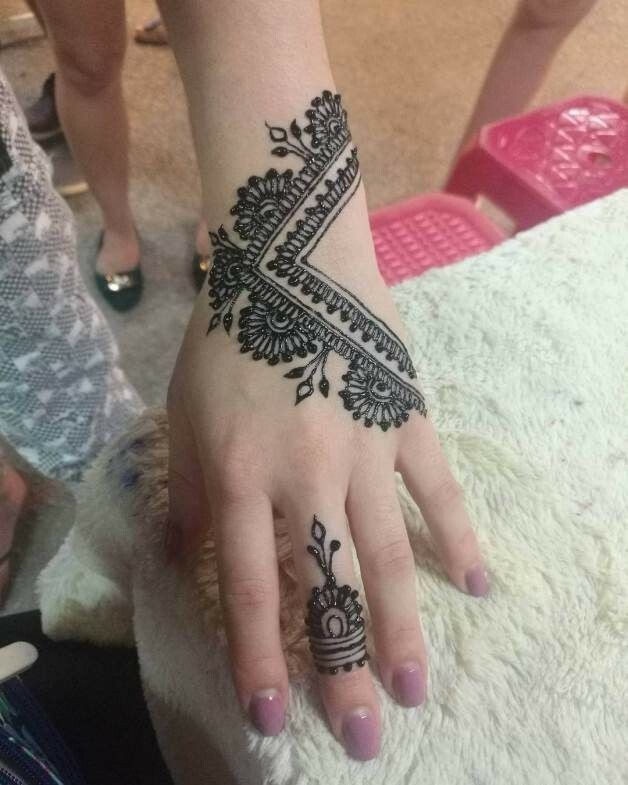 These patterns are mostly drawn on both back and front of hands and also on feet of brides to be or married women. Today this decorative art has gained a new significance and women have started applying it on shoulders, back neck, front neck and even on the belly for a funky hip look. Mehendi is essentially applied for the gorgeous natural and temporary colour it imparts but this herb also has a lot of medicinal and cooling properties. These properties help calm the nerves and reduce stress before important events like weddings. Henna is also associated with positive spirits and luck which makes it ideal for application before any special and happy occasions. No wedding in the Indian subcontinent is complete without the bride applying intricate henna patterns. Infact these days a lavish and elaborate mehndi ceremony is thrown prior to the actual wedding where all women and sometimes even the men get mehndi applied on their hands and feet from professional mehndi artists. 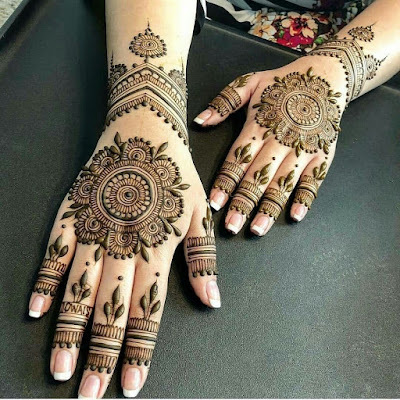 Weddings are not the only time henna patterns are drawn to enhance the beauty, ladies apply mehndi before many other important festive and special occasions like eid, diwali, karwa chauth, engagement, dinner parties, cultural events, college fests etc. 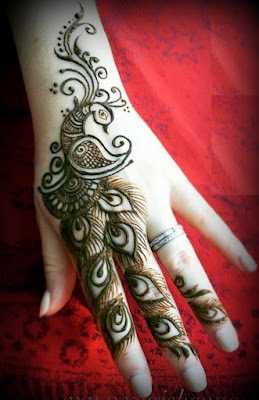 Mehendi designs are applied using cones these days which help drawing delicate patterns on hands, feet, legs and arms. These henna cones can be brought ready made from bangle or bridal shops or you can yourself make cones at home from natural henna powder. If you have fresh henna leaves then grind them into a thick paste add some drops of eucalyptus oil which you can fill into plastic cones. If you dont have fresh leave then dried henna leaves also work well or you can use store brought natural henna powder to make a paste. After making a paste let it sit for about 3 hours to relase dye or even overnight before filling it into cones if you want darker coloured henna on your hands. After cones are made you need to just cut the tip with scissor and start applying any pattern you like. When cutting a cone be careful to cut it really thin as this helps you draw bth thick and delicate lines. If your mehendi design is multi patterned with a mix of thin and thick strokes then I suggest you use two diffent cones which helps you apply design easily. You can cut one cone thin and second cone thick. 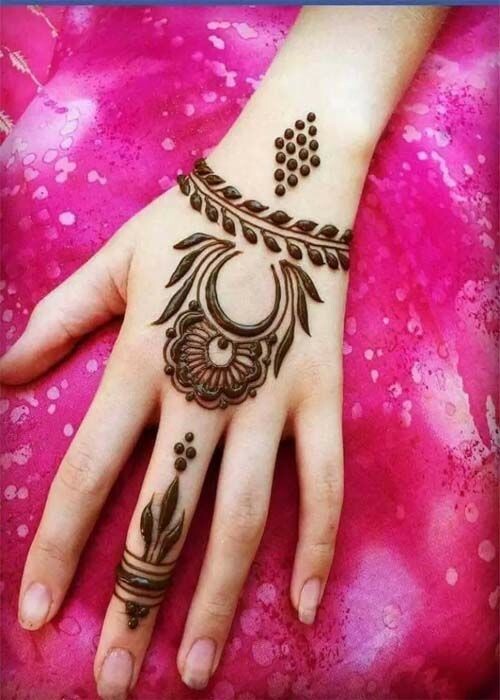 These days there are a lot of different kinds of mehndi patterns and designs availble for women to select from. if you want a more traditonal pattern you can try rajasthani mehendi designs, marwari mehndi patterns or even full hand arabic style. 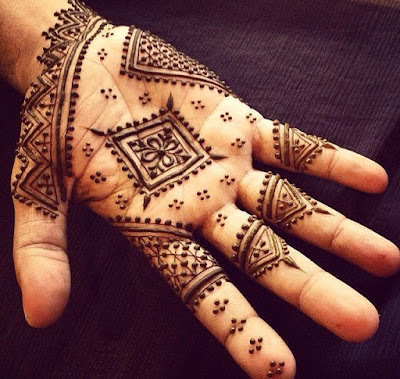 For more modern and unconventional patterns try Moroccan or gulf mehndi designs which are more minimal in nature. 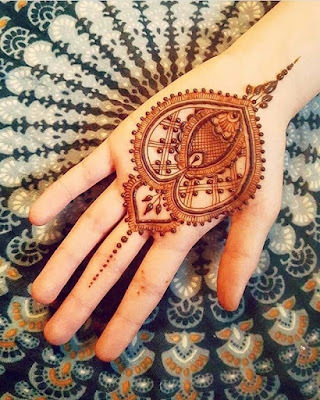 Not all mehndi designs need to be complex and intricate. Even delicate patterns can look really pretty on hands. 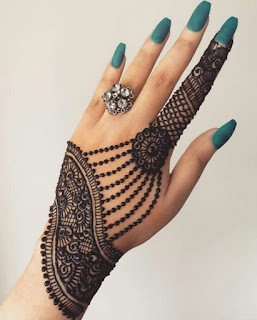 Today in this post Iam going to bring to you a huge collection of simple mehndi designs for hands which can be applied easily even by beginners. 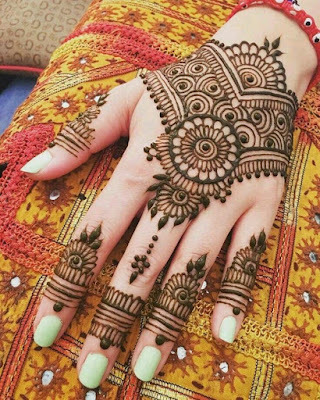 There are many types of mehndi designs you can choose from these days like indian, rajasthani, pakistani, moroccan and arabic. 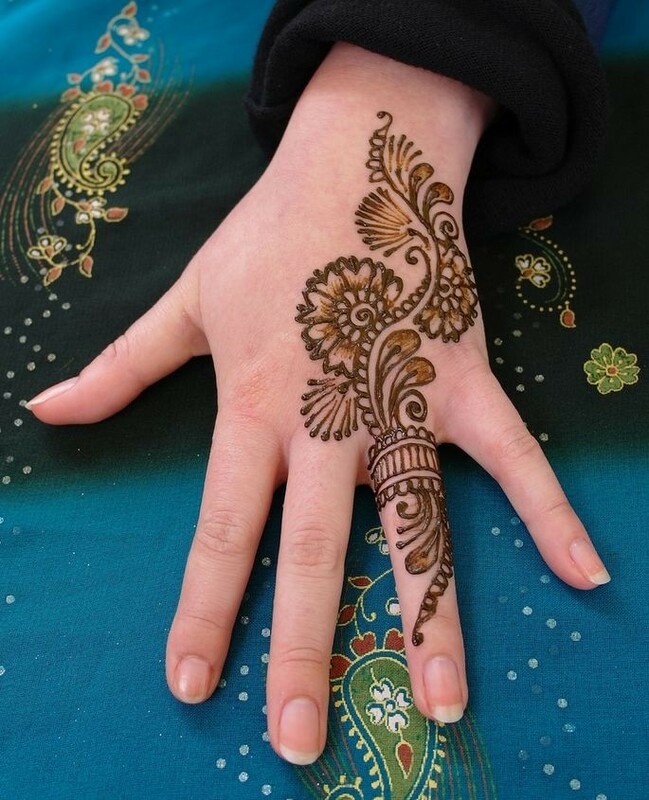 Arabic mehndi designs are very popular these days with women of all ages across the globe. If you are looking for a simple mehendi design for hands then this henna pattern with thin delicate swirls, flowers and paisley leaves is a perfect pick. 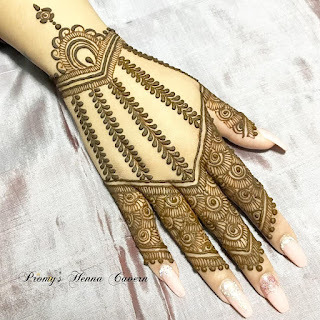 While most arabic mehandi designs cover the entire length of hand this design runs across only your palm giing a very subtle, modern yet beautiful look to hands. You can apply this mehndi design on relatively simpler occasions like cultural events, parties, rakhi, teej ,valentines day etc. 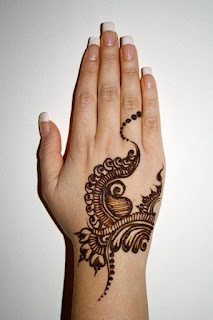 This is a very pretty yet simple mehandi design even beginners can draw. Floral patterns are loved by all women and this design uses a series of floral motifs along with thick swirl lines representing leaves. 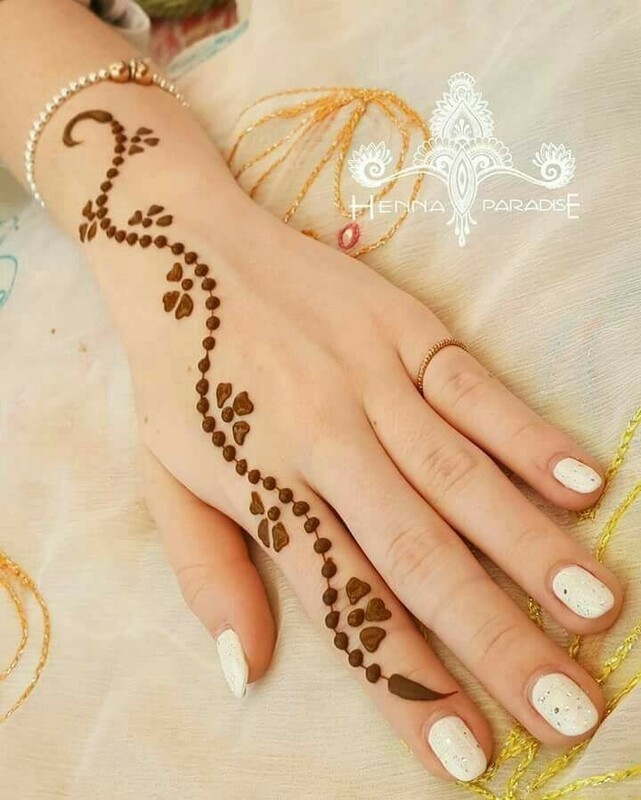 The swirl leaves on all the finger tips add to the beauty of this henna pattern which can be applied on both front and back of hands as per your preference. 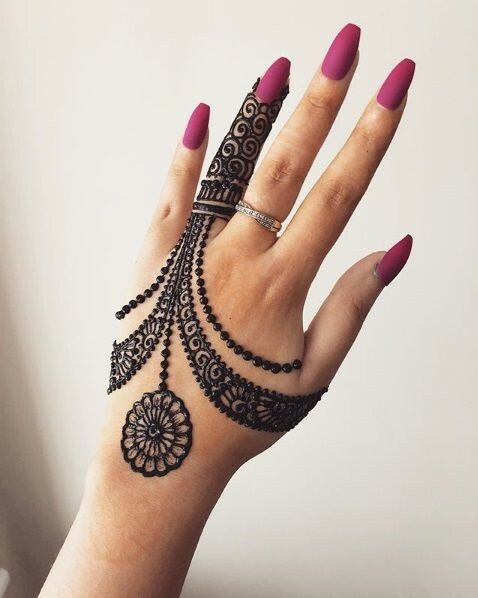 This is an easy design which wont require much time for application so young girls can give it a try at events like festivals or weddings. If you thought the design about isnt that easy then have a look at this design which is even simpler and sleeker ideal for fresh beginners. 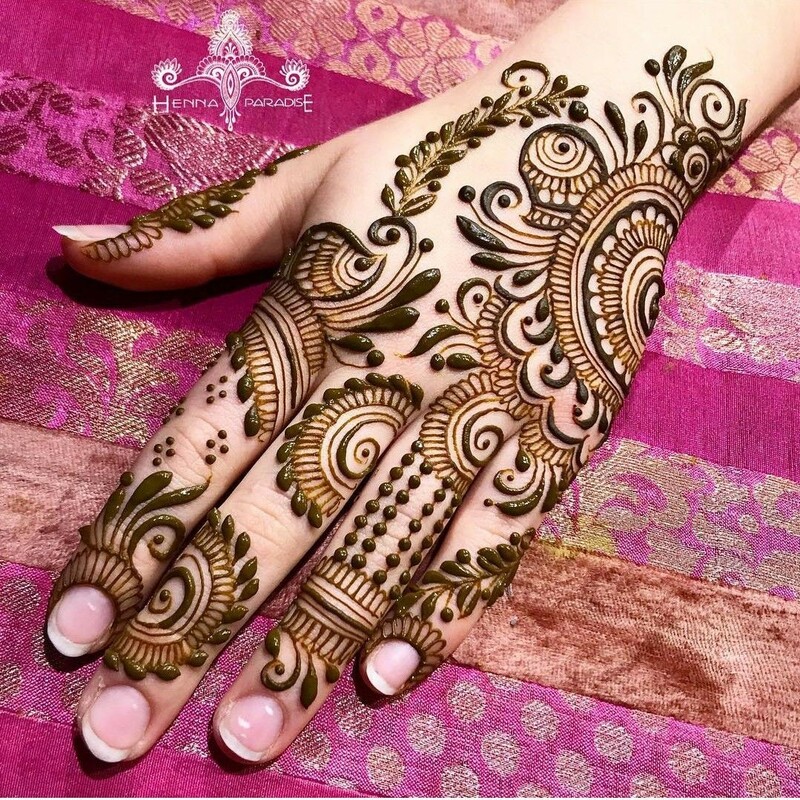 This design has arabic inspiration with half flower serving as the main visual delight while swirls and lines around it extend it to make it a full hand mehandi design. 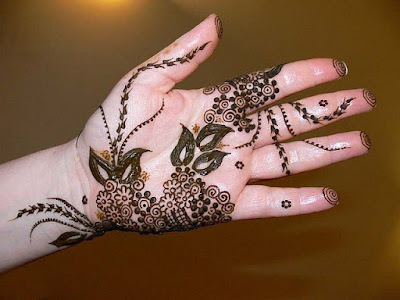 Try this if you are really new to the art of henna for simpler occasions and events. 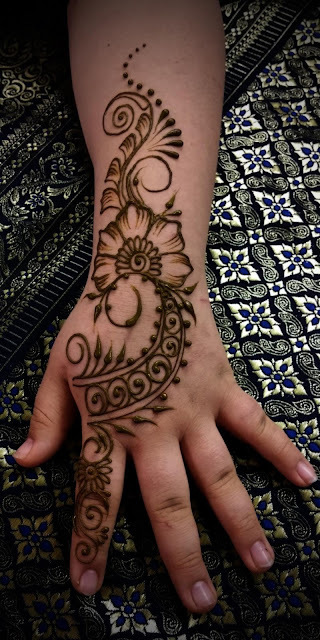 This one is a really stunning mehndi pattern with paisely florals and leaves making for a delightful visual treat. This mehndi pattern uses both thick and thin strokes which enhances the beauty of the pattern and the jaali detials give it a delicate and intricate touch. If you think this mehndi design is actually complicated then let me tell you , it actually isnt. 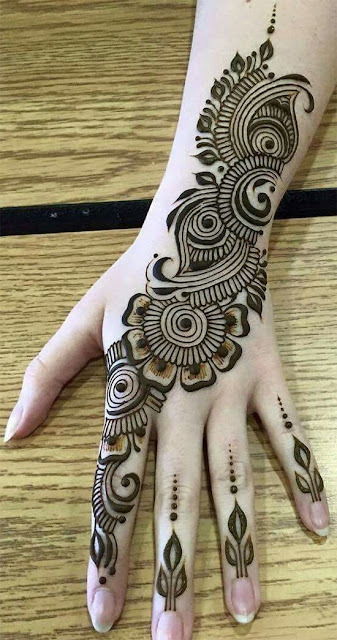 Even beginners with basic mehandi application skills can bring this design to life with a bit of patience. This design I feel is actually well suited for big occasions like the wedding or engagement and even the bride herself can get something similar applied if she wants to go the minimal route. 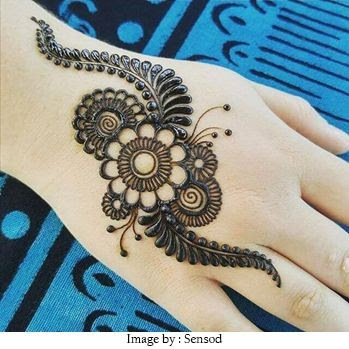 Thick and bold, single line simple mehandi designs are perfect for traditional events like college fests, eid, bhai dooj etc. This design is fairly easy to bring to life, start with a flower in the middle with a thick cut cone and then go around extending it to both sides. For added spark this design has some shaded details in the flower petals which i feel is a nice subtle way to draw attention to your hands. 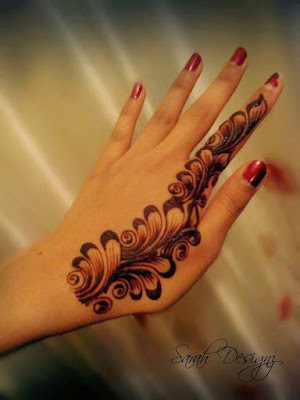 Another very gorgeous arabic mehndi design which is also easy to apply with neat clean strokes. This design works well for women who want a simple pattern but dont want really subtle or minimal patterns. 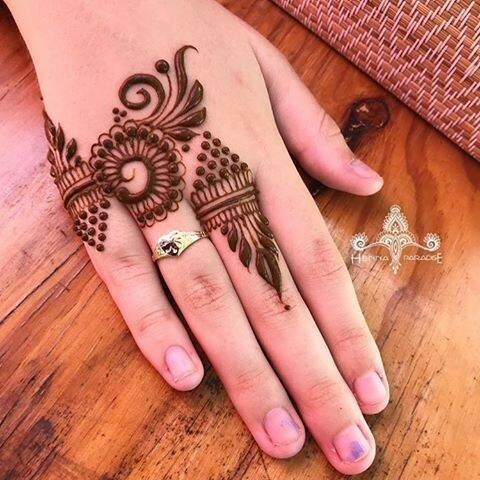 This mehendi design is simple yet covers the entire length of your hand making it ideal for special occasions like engagement parties or even your siblings wedding. These days I have noticed women go for henna application on backhands and ignore the front of hands. 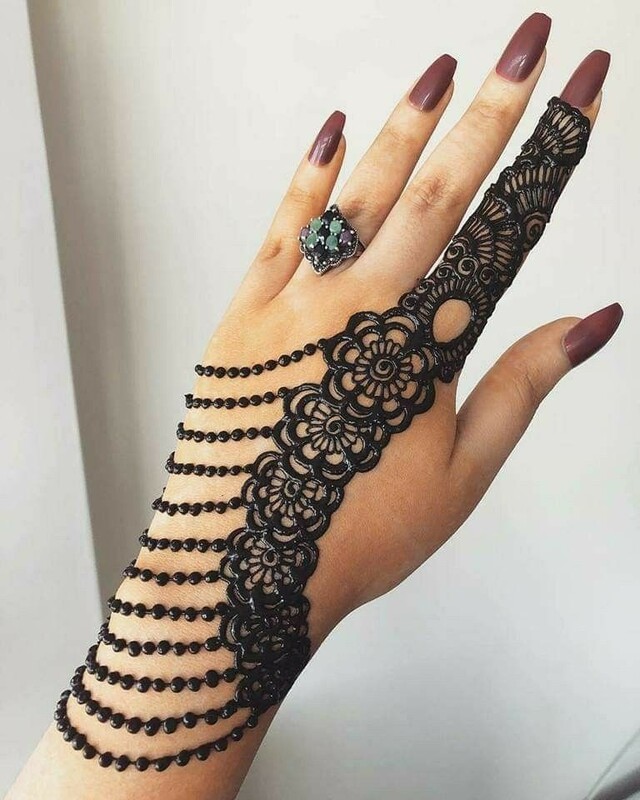 If you want to follow this trend then choose this design to beautify the back of your hands. But all these designs arent very simple yaar? 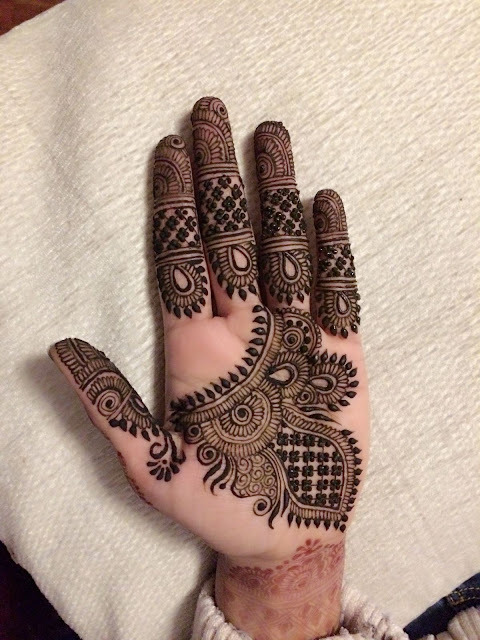 Well here is an uber easy and simple mehandi design suitable for women of all ages. If you are a starter with henna art then just practice simple lines, dots and circular strokes on a book using mehendi cone and you are ready to apply this design. If drawing perfectly shaped circles is an issue then I suggest you use a small round object like a face wash or bottle cap to draw c;lean crisp circles and then drsw tiny delicate lines around it and finish of with dots all around. This pattern is going to look good on anyones hand so you can try it on your sisters hands or even your own. If you want to get this pattern on front of hands, there also it can work well, do give it a try. Do you love applying mehendi but dont have much experience with this body art? Then select this design this festive season which is easy to apply with a thick cut cone and looks absolutely fabulous with well manicured hands. 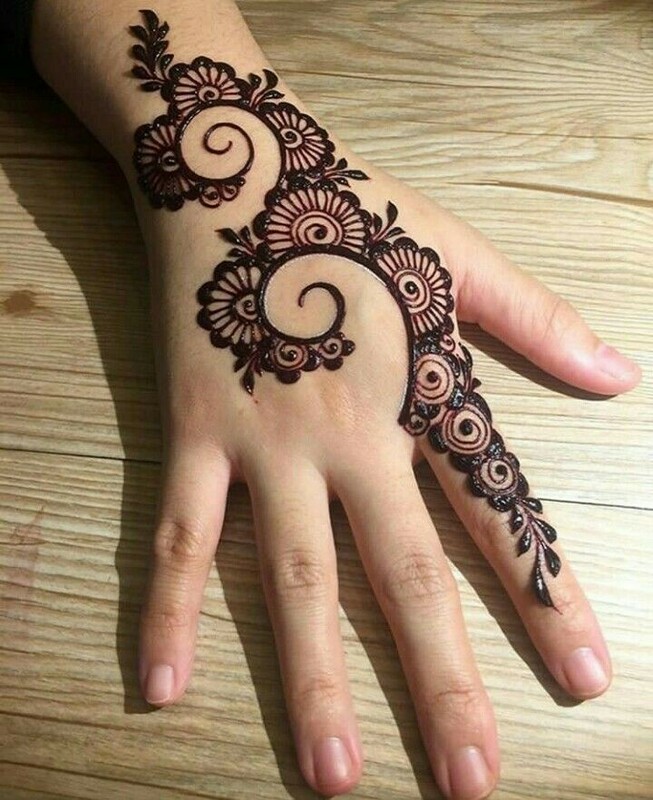 I just love how unique this pattern is as most simple mehandi designs are crowded with floral motifs and this one uses the beauty of thick leaves to stand out on its own. leaft rings are also used on all other fingers to complete this design and give it a more rich look. If you are looking for simple floral creeper style pattern for the palms of your kids then this shaded design which has an asymmetric edge giving it a very contemporary feel. You can try this pattern for occasions like engagements of close family members, anniversary parties or festivals like eid or diwali. Prettiness is all loaded in this easy swirl flower pattern for back hands . This design is very simple and you can draw it up in a jiffy if you are busy with getting stuff ready before a party or event. Ditch the florals and go for the yummy and delicious strawberry pattern design on little ones hand. Iam totally in love with this adorable yet simple mehendi design for kids which I will sure try on my darling daughters hand on eid. A simple, sweet yet alluring mehendi design for kids, this paisley pattern is a classic and can be quickly applied by starters for any occasion your desire. 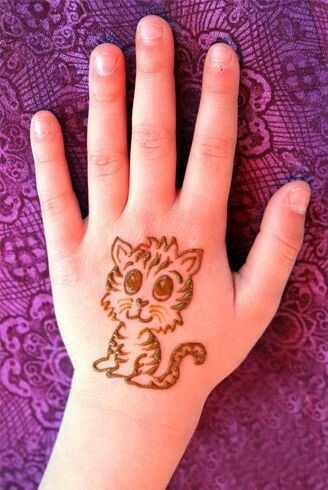 You an leave the finger tips bare or colour them for a more fuller mehndi look on your little ones hand. Pair a floral vine with a cute butterfly for a sweet and innocent looking mehendi pattern which will delight your little munchkin. This design can be done on back hands and you can go for a fuller pattern for front hands. Small girls also love arabic henna patterns but apply complex designs on their small hands is a task in itself. This simpler arabic mehendi version is actually really pretty and quick to draw on your little girls hands. You can try this pattern for your kids on occasions like eid, diwali, parties etc. All our kids are a fan of cartoon characters or even pets. Instead of going the traditonal route try some unique cartoon motifs on hands of your kids which they will love to show off to everyone. This design is actually ideal for little boys who want to apply henna as well after seeing their mothers applying henna. 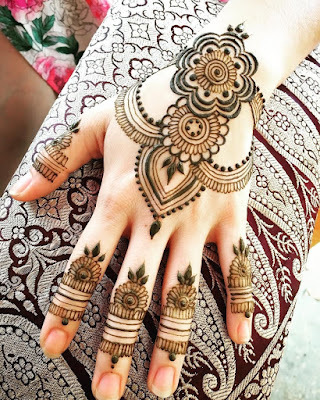 Traditional Indian mehendi patterns used to be round or circular patterns which also came to be known as mandala mehendi designs. 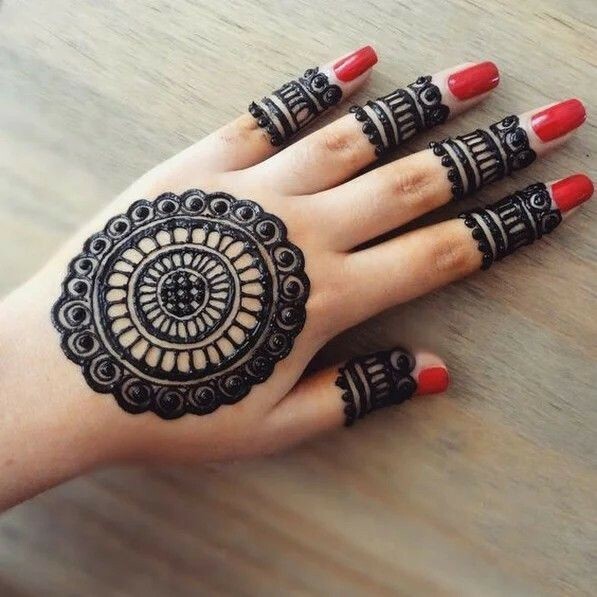 These mandala patterns are suitable for women of all ages and can give a nice minimal yet festive traditional look to hands. 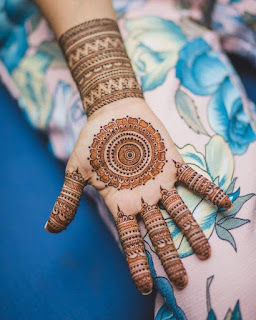 Mandala patterns are coupled with intricate finger designs which give hands a more fuller and complete look which even brides can opt for if they want something simpler for their big day. 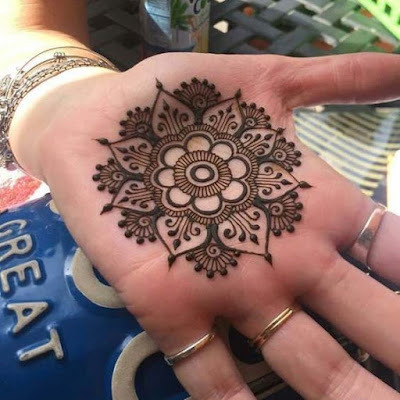 Here are some simple mandala mehndi designs you can take inspiration from this festive season. If you are a beginner then hone your skills by practicing on hands of kids in your home. 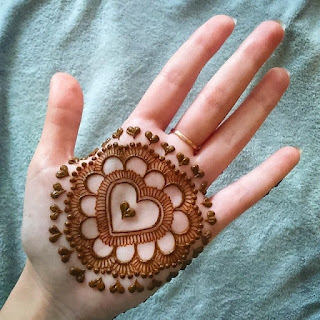 You can even grab kids from your locality and try simple patterns like this heart shaped mandala simple mehendi designs which help you better your henna application skills. 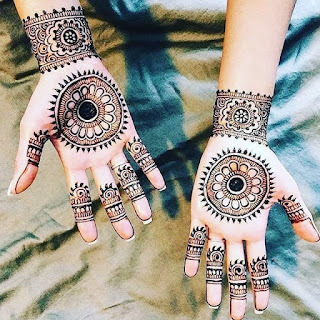 If traditional indian mehendi designs are what you are looking to try then this gorgeous intricately patterned mandala design is an absolutely fabulous pick. The best thing about this design is that being traditional and thick it can suit all Indian special occasions yet it is very easy to apply. Mandala designs look good not only on palms but also on back hands. If you are a bride who want something subtle yet hand filling then this simple mehendi design with bracelet style addition on wrists is a great option. You can pair a mehandi design like this with a different mandala pattern on front hands to get a complete gorgeous design pattern on both sides of your hands. A simple yet pretty mehandi mandala design which is complemented with a bracelet style pattern on wrist and then joined with a dotted line to give an illusion of hathphool. The latest trend is jewellery inspired mehendi designs and this pattern helps you flaunt the latest trend. 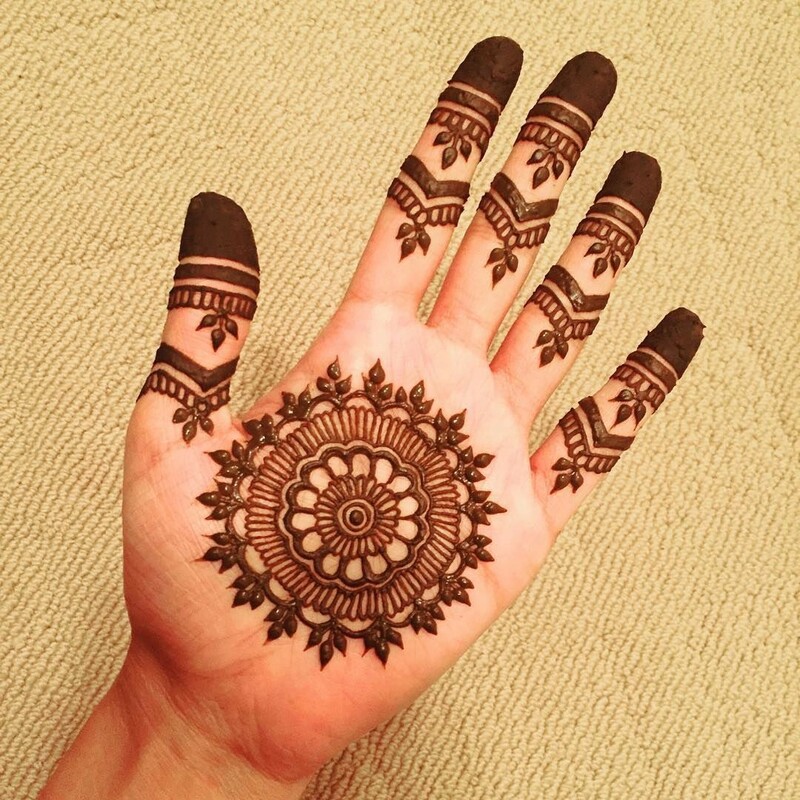 This mehendi design is ideal for back of hands to give a traditional look at any occasion or event. 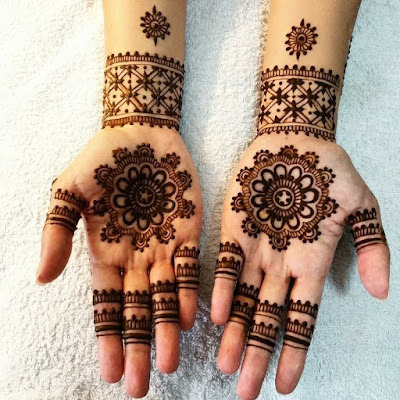 If you want a traditional style mandala mehendi patterns which are simple and make your hands look full without actually going for the crowded pattern then design is apt for you. This actually is a very gorgeous pattern to flaunt at weddings of close relatives or friends and even at events like engagements, sangeet etc. 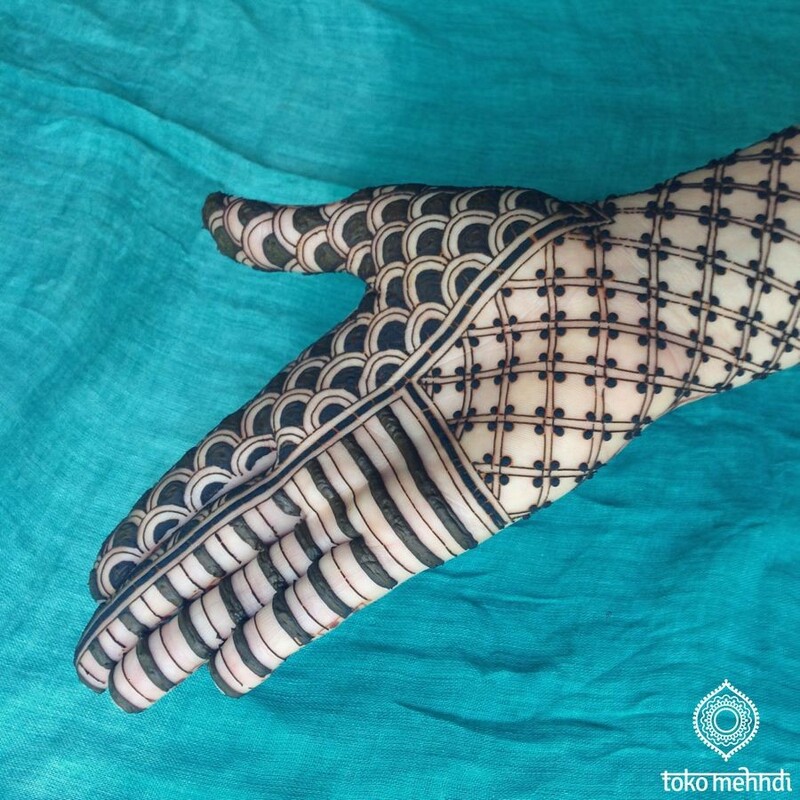 Bored of mandala patterns on your palms? Then we have a trendy new way to flaunt these classic mehendi motifs. Apply them on wrists and go for a half mandala pattern on side of your hand for a stunning asymmetric look which feels both modern and fun. 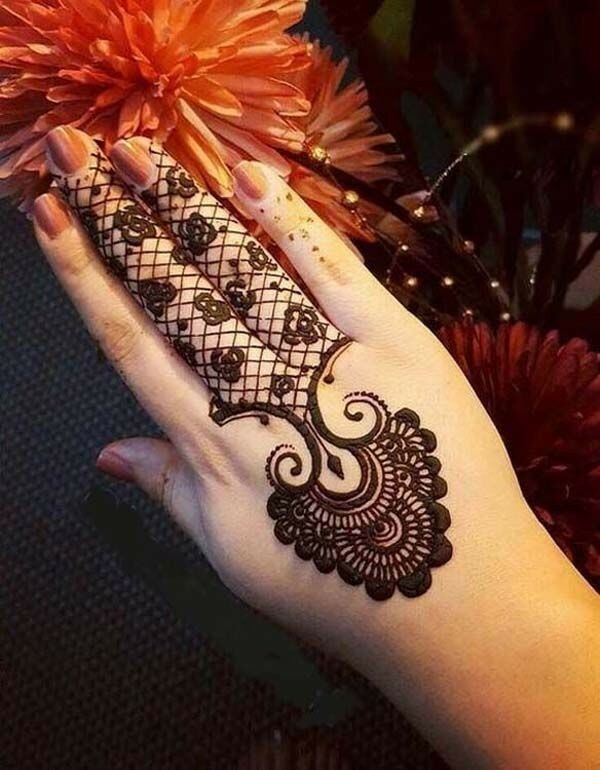 This simple mehendi design can end up looking very disconnected and incomplete so make sure to pair it up with appropriate finger mehndi pattern which runs over all 5 fingers. This design is more suited for young girls to rock with indo-western outfits. 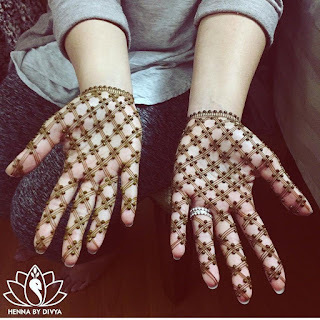 If you are looking for a matching simple mehendi design to apply on both your hands then mandala mehendi patterns are your best bet. 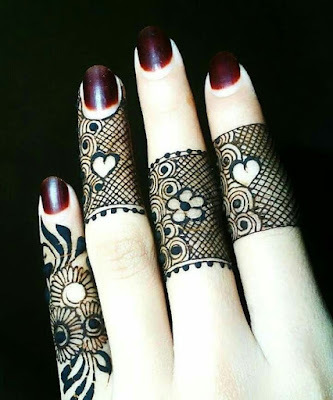 Getting same kind of mehendi pattern on both hands can be challenging task for beginners but with this design you can rarely go wrong. This pattern keeps the focus on your palms and is a very traditional design ideal for women who want to pair it with ethnic wear like sarees, lehengas and salwar suits. These days weddings involve an elaborate mehndi ceremony where bride and groom were matching or contrasting outfits and get mehndi applied amidst a lot of dance, fun and games. While brides get complex and full hands patterns drawn from professional henna artists men opt for simpler and minimal mehendi patterns. Here I bring to you a collection of simple mehndi designs for groom which men can take inspiration from for their 2019 wedding. Florals are a very popular pattern in mehandi designs but for men geometric styles suit better. 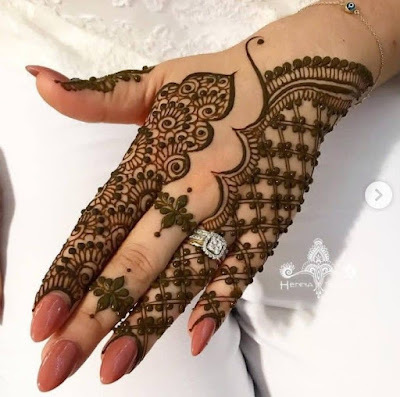 This particular moroccan mehendi design doesnt cover your entire hands but is good enough to be considered a proper gents mehndi design for weddings. The whole idea of leaving the palm bare is quite a happening trend and why shouldnt men also follow style trends? If the idea of moroccan patterns dont excite you then go for a blend of indian mehendi designs and a bit of geometric patterns which suits the classic wedding vibe and the personality of men too. This mehendi pattern is easy to apply and follows the asymmetric pattern with lots of empty spaces dits floral motifs, shaded details and more. 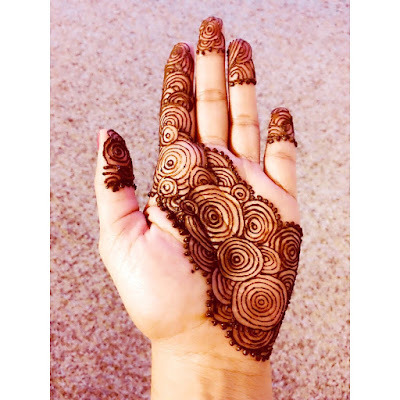 this mehndi pattern when applied on both hands can make for a gorgeous yet simple mehndi design for groom which can complement the beautiful fuller bridal patterns well. Show off your love for your soon to be bride with a simple mandala design with her name inside it. You can even go for both of your initials instead of a complete name. 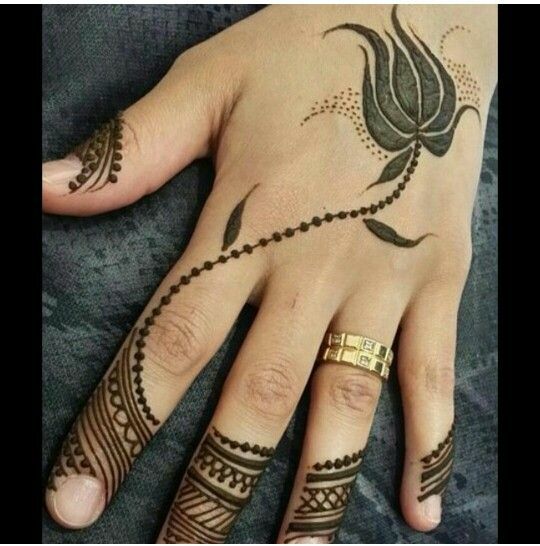 This makes for an easy and meanigful gents mehndi designs men can try in 2019. Even if you arent a groom to be and want to dablle in the henna art you can give this design a try with your own name inside the mandala. A geometric take on the arabic mehendi designs, this diagonal mehndi design for groom is also a fabulous pick and is quiet different from the usual henna patterns you spot on grooms. 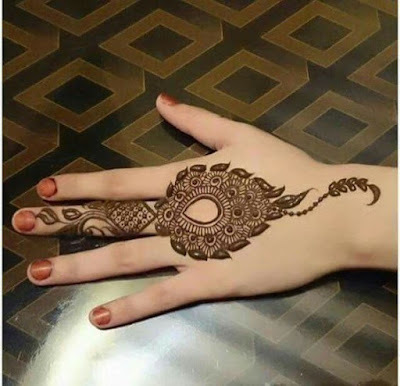 This simple mehndi design can be applied by anyone including beginners and is sure to fetch you complements for trying something different. Mehndi is being adopted rapidly in the western countries as an alternative to permanent tattoos. 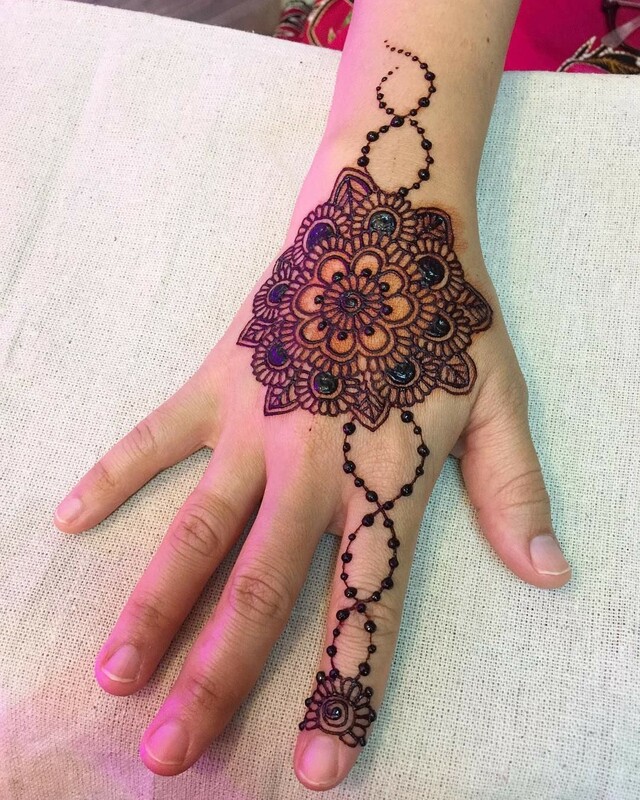 These tattoo inspired henna patterns are applied not just on hands and feet but also on neck, back neck, belly thighs and even arms. 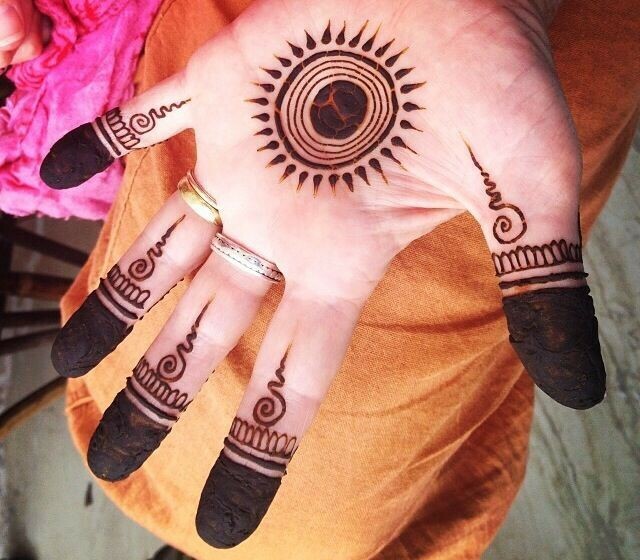 Traditionally however mehendi has been applied only on hands and feet. Even feet henna isnt very popular because the indian culture doesnt allow unmarried young girls to get their feet coloured with henna. So in this scenario it makes sense to concentrate on learning hand henna patterns especially for front hands as the dark reddish brown colour of henna contrasts best on the front hands skin. 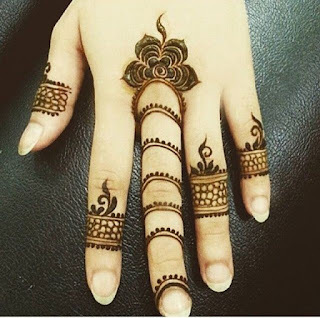 Following are some really pretty simple mehendi designs for front hands which all beginners must give a try in 2019. The traditional simple mehandi designs can get monotonous after a period of time which is when you should experiment a bit. This geometric inspired pattern which is heavily applied on palms is a fabulous pick if you want to try something different and unique. This pattern covers most of the front hands but still doesnt look clutters because the geometric design has lots of empty space bits. This design is appropriate for big occasions like weddings. Here is another very alluring mehndi designs with shaded florals and mesh detailing. The main attraction in this design however is the subtly placed peacock motif which gives this design a very traditional touch which covers almost entire front hands. 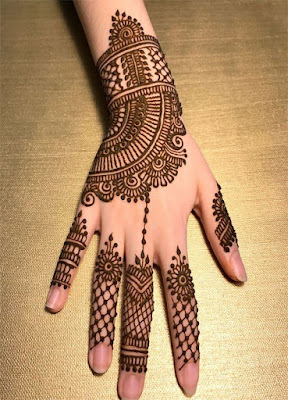 You can try this stunning henna pattern on the sangeet ceremony of your friend or even diwali parties and it going really enhance the beauty of your hands. Now this design is what you should select if you want something different yet not too experimental or bold. I love how the focus of this design remains the fingers with all of them following the same pattern and then inspired of going the arabic design way this designs leans more towards indian mehndi pattern and rest entirely on the palm. 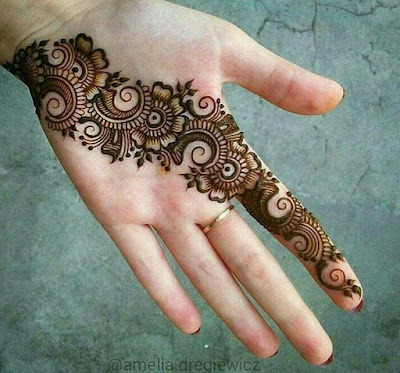 Finger tips mostly are covered with thick henna paste but this pattern goes for a floral intricate pattern which add to the fun element of this design. 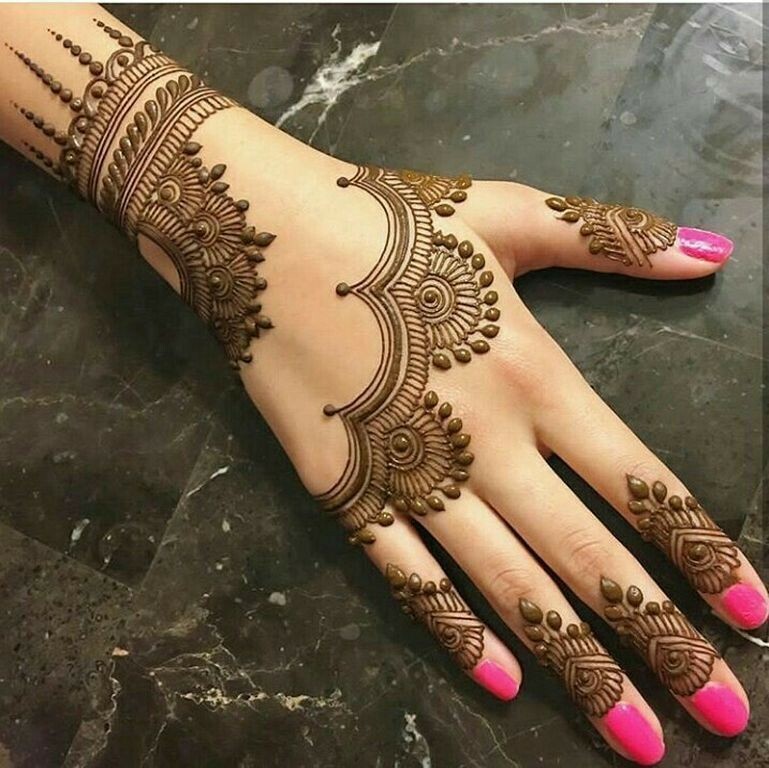 This design looks very complicated but if you look closely it is actually a very simple mehendi design using common mehendi strokes and motifs. 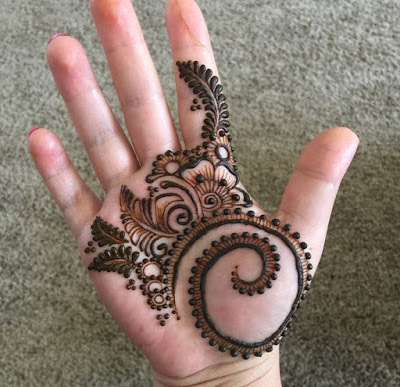 This is a very unique simple mehndi pattern for front hands which keeps the focus on palms and uses a dotted over sized swirl as a base. This design is more suited for the younger brigade and can be applied for kids of 10-15 years as well to match with indo western dresses like cape gowns, palazzo jackets etc. 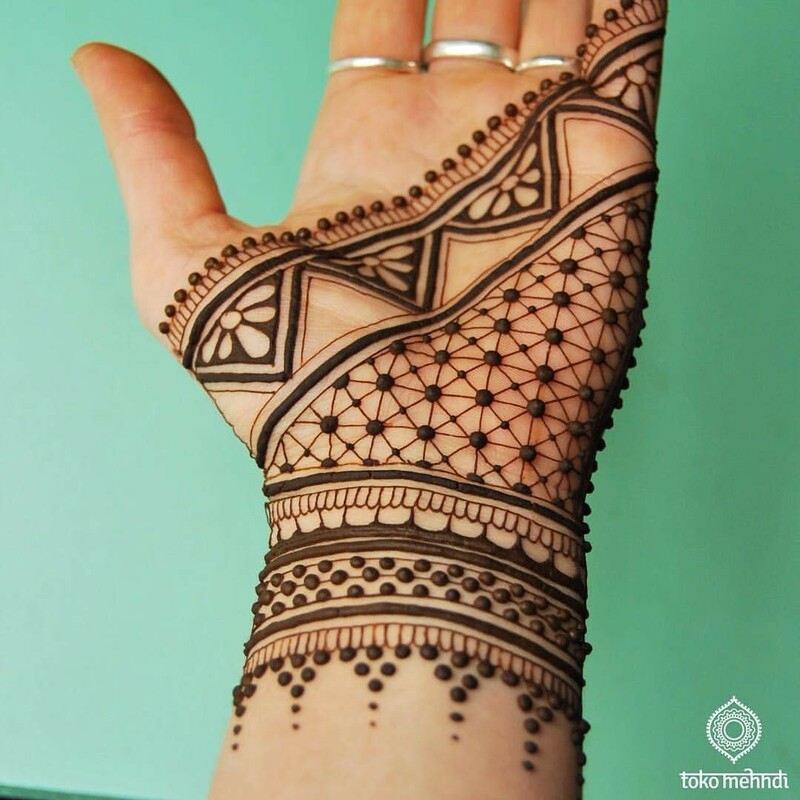 A very unusal looking simple mehndi design, this pattern uses florals with restrain and sticks to geometric strokes. If all the feminine floral and chic patterns are boring you select this pattern which comes as nice break from the usual. This pattern is also very easy to apply and is unisex too. If a a pretty and artistic pattern is what you are aiming for this mehndi design can serve as the great pick. This visual delight of a design uses really thin strokes to bring minimal and delicate pattern to life. The mesh inner details and dotted outer extension all add to its charm further enhancing its elegance. Totally recommend this pattern for weddings. If you are a busy mother or bride, or other of groom, sister in law at a wedding get this pattern applied quickly and roam around heck free. This simple mehendi design for front hands is pretty delicate and chic and the thick leaf details bring about a nice balance making it bolder and more prominent. 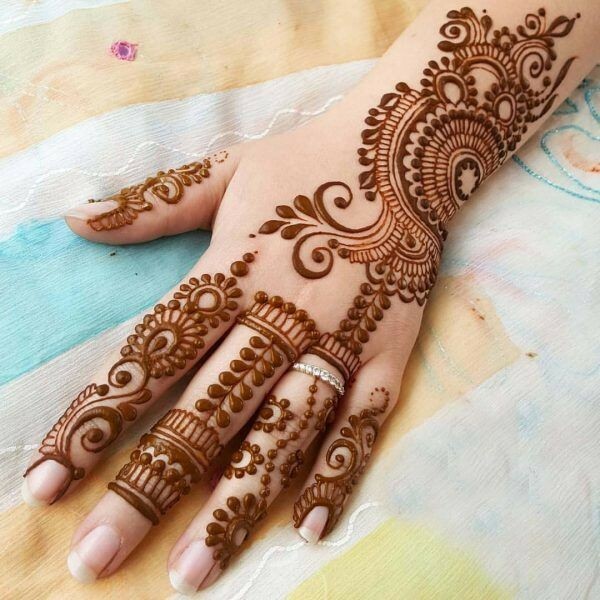 I would suggest this mehandi design to young women who are looking to experiment with a variety of different silhouettes for different pre wedding and wedding ceremonies as this pattern will go well with all kinds of indian and indo-western dresses. 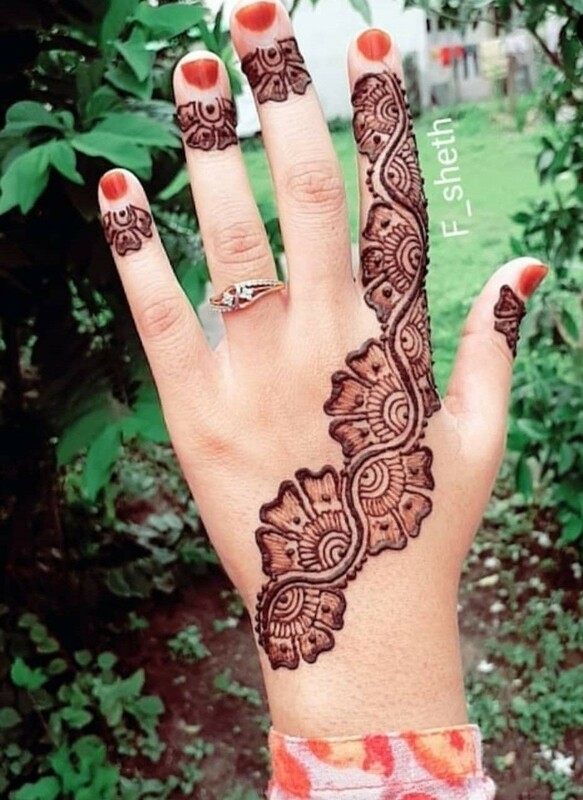 This simple mehndi design for front hands with a flower and paisley inspired leaves around a huge swirls running across a single finger is ideal for festivals like diwali, karwa chauth , bhai dooj and teej. 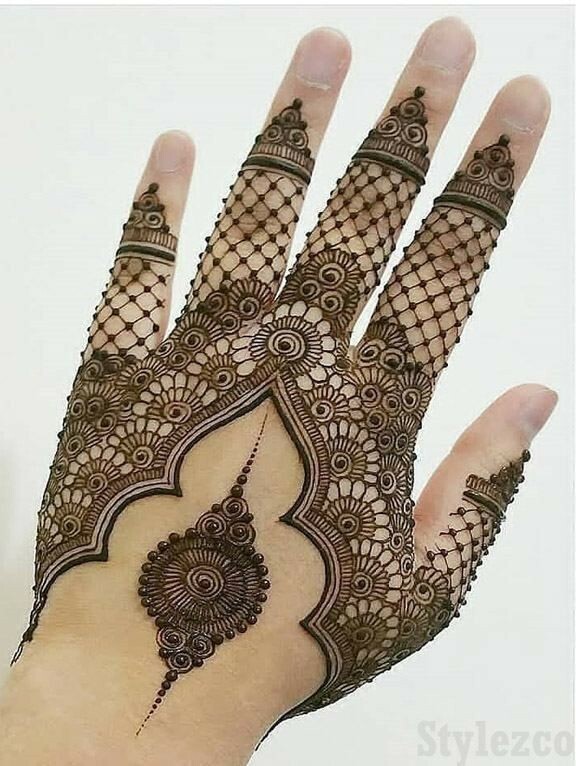 you an get this applied from anyone in your family having basic henna application skills as there not much scope to go wrong wit this pattern. 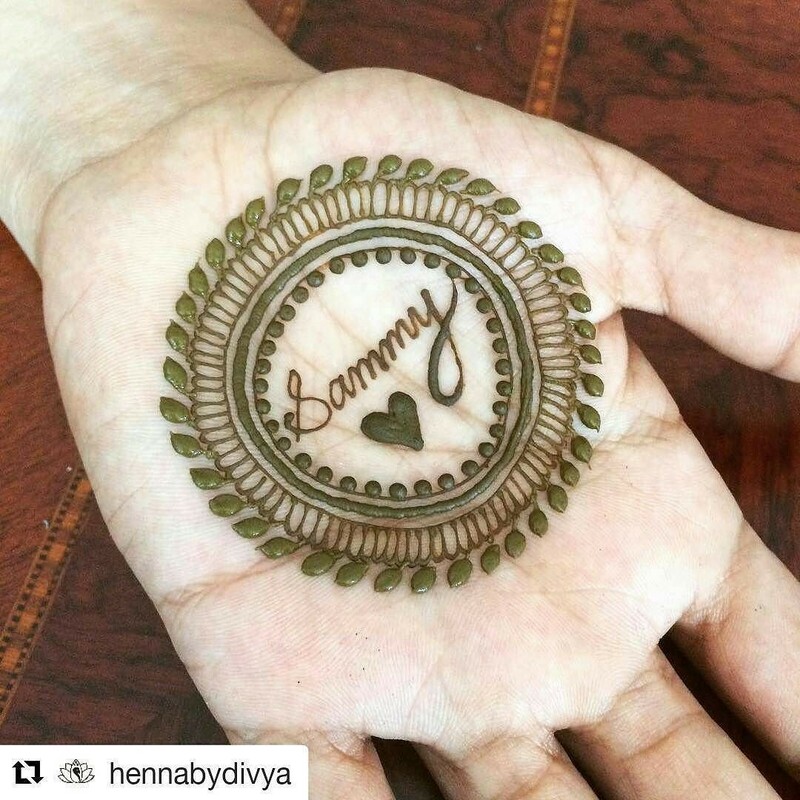 Are you looking for something totally hatke and different to decorate your palms this wedding season? Then this lace strip mesh henna pattern is perfect for you. This pattern starts at the wrist and runs all the way upto finger tips yet gives a very balanced look all thanks to the spacey lined positioning. 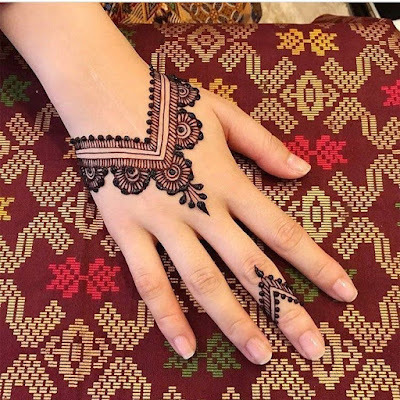 Simple floral motifs and jaali is used to form a lace like strip which is followed by dotted thick lines making for an easy henna pattern even beginners can apply. In addition to apply henna mehendi designs on front hands ladies also love to beautify their back hands. These days it is a huge trend to apply mehendi just on back hands totally leave the front hands bare for a very fusion sort of look. At a recent wedding I spotted many of my cousins embrace this nice unique trend where they had applied some alluring jewellery inspired back hand mehndi patterns with bare front hands and it made for a nice balanced look when paired with their indo western outfit silhouettes. 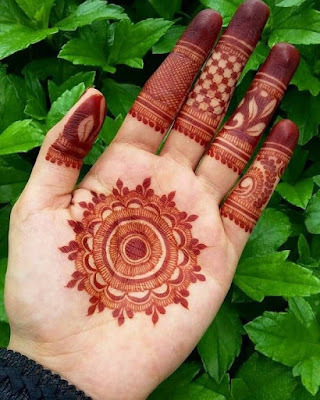 If you are also looking to apply mehendi on back hands then I suggest going for simpler patterns like mandala for front hands or even leave the whole hand bare strike a trend. Here are some back hand simple mehndi designs you can get inspired from. It cant get any simpler than this. If you are having a touch time getting floral motifs right then stick to simple leaves running across the back like creeper of sorts. the two creeper trails intersect to form an alluring pattern which is easy yet visually appealing. 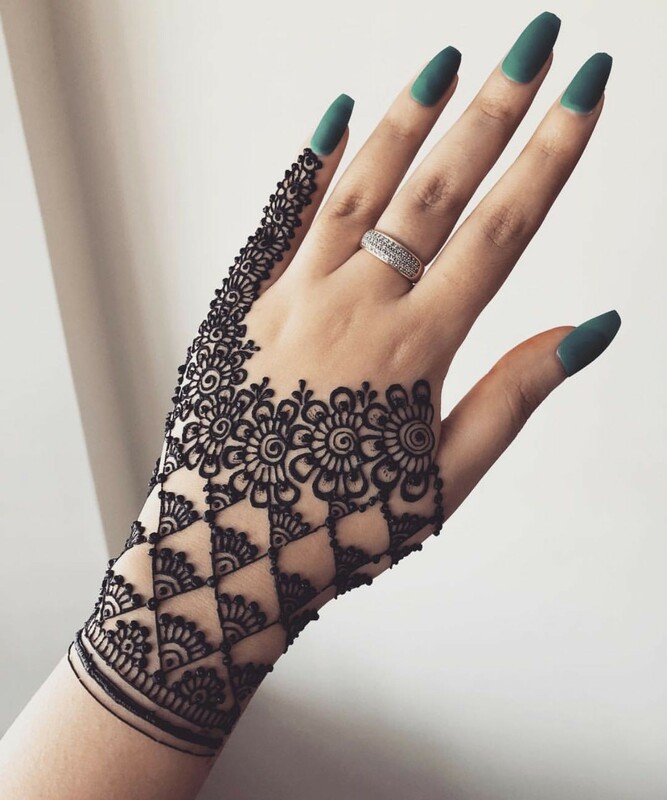 Fancy a mehndi ring on your finger? 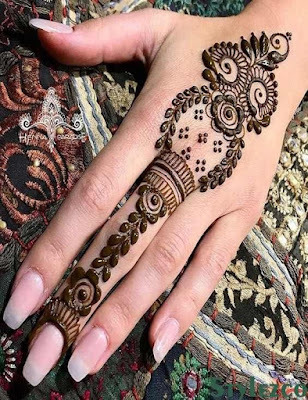 Well then try this henna mehendi design which follows two different patterns on two different sides of hands and leaves a swirling space and a finger empty in between. This space is then joined by ring style pattern to give an illusion of jewellery design. Isnt this pattern just smashing wow? 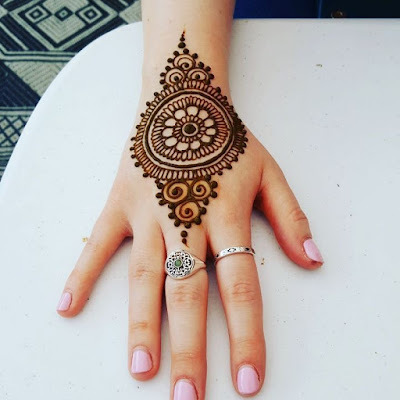 Try this on occasions like your engagement where the back of hands will be the focus and you can flaunt your gorgeous ring with a stunning henna design. An artistic shaded leaves only pattern can get any mehndi lover excited. This design also has a mesh inspired finger pattern with leaf on all other finger tips to give a alluring complete look. Five finger hathphools are what brides wear in india and this mehndi design is inspired from that bridal jewel. 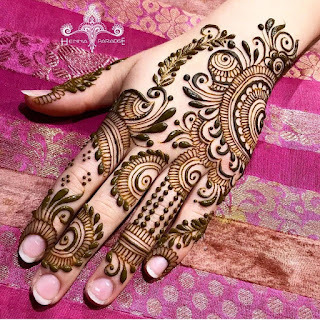 You can give this relatively easy yet very traditional style mehandi design atry weddings or grand occasions for a fuller and heavily inked look. This design will look great with floor length anarkalis and heavy lehengas. 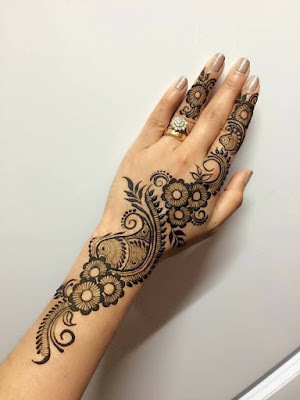 Planning to get a simple mehndi pattern on back hands then try this pattern which is easy yet it will stand out beautifully in a crowd giving a very stylish vibe. 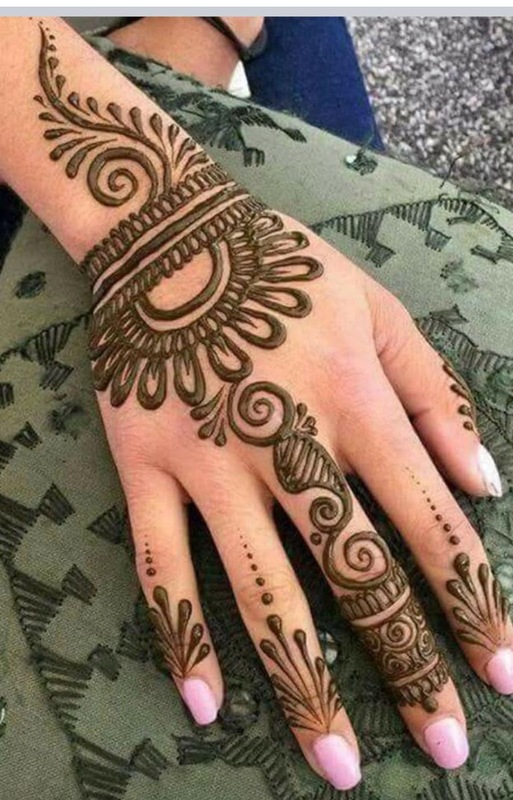 Dotted and mesh swirls from both sides merge into one finger which has heavy detailing and the design is further completed with addition of a mandala style flower joined with dotted line. Forget complicated motifs and concentrate on basic patterns like circles to sharpen your henna application skills if you are a beginner. 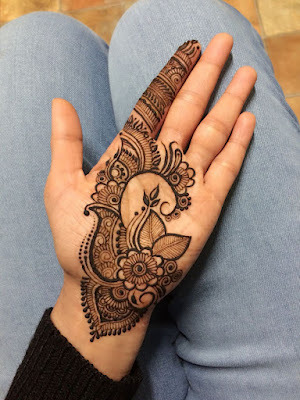 Even if you arent starting out with henna application this clean and crisp henna pattern is a winner all the way for the sole reason of it being super quick to apply ideal for busy moms and working women. Ditch the regular and embrace some quirk with this diamond shaped double henna motifs which are placed a bit far away and then joined together with a thick swirl . The simple leafy pattern on fingers complement this trendy design well making it a glamorous choice for busy working moms . Mehandi art is associated with positive energy and good luck so women getting married always apply mehndi beforehand. 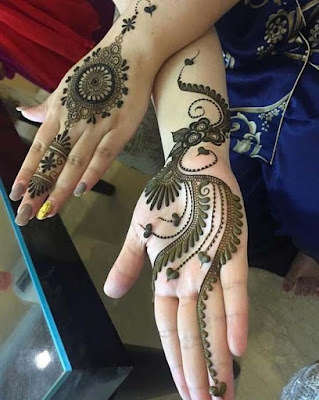 Not just new brides but other romantic occasions like valentines day, anniversary parties, engagements, roka also calls for mehndi application to make the occasion more special. 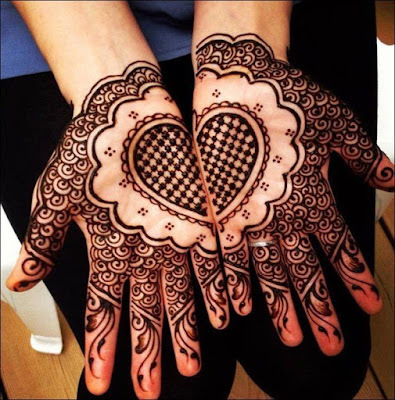 For romantic events like these heart henna patterns suit best. 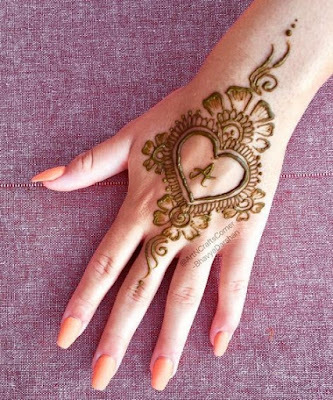 Try one of these heart style mehndi this season of love. 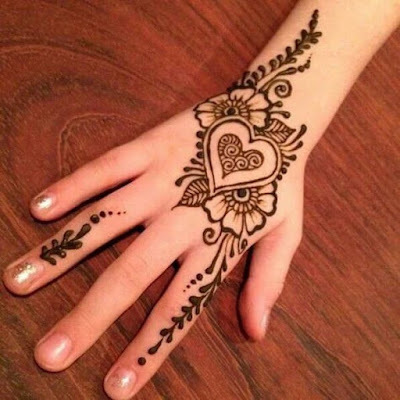 Jewellery inspired henna pattern with a heart as its sole focus is a fabulous pick for anniversary party. This design is almost full hand design but the fingers are left clean giving a very modern vibe suit smaller and simpler events. 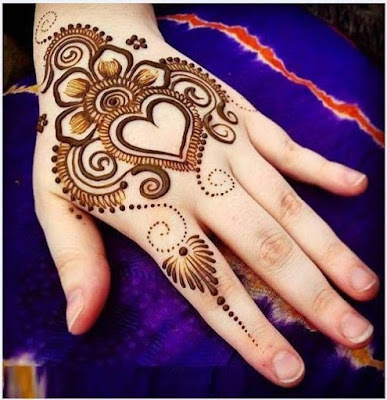 Here a symmetrical heart pattern is drawn half and half on both hands to give a very romantic mehndi design ideal for minimal younger brides. The heart pattern is filled with checkered jaal which gives it a very trendy feel while tiny swirls fill rest of the hand. This pattern looks pretty difficult to apply at first glance but the more closely you look the more you will be convinced that it actually very beginner friendly. For minimal bridal henna patterns you an just go for a heart motif surrounded by florals and add an initial of your loved one in the heart. 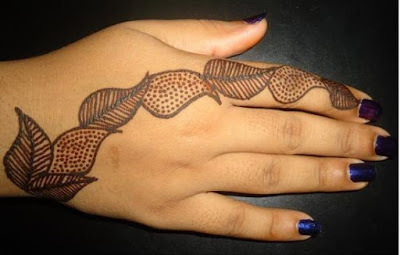 This pattern of mehndi design is simple to apply and can work well for engagement or anniversary also. Instead of the initial you can also draw the entire name of your partner for more personal touch. 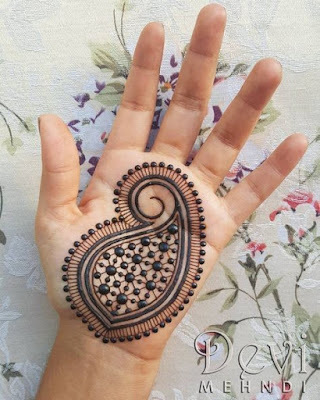 Just draw a simple heart and dont fill or shade it to let it stand out more and then go about drawing some basic mehndi strokes like swirls, dots, and a flower base giving you a very nice heart henna pattern you can apply at simple occasions. 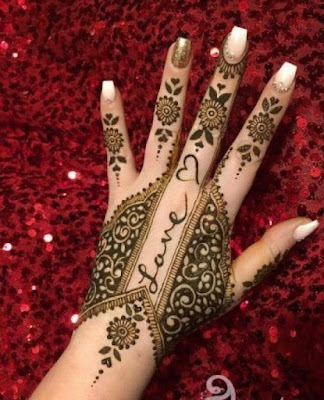 Instead of going full on heart motifs for romantic events you can even try shaded henna design with the word love written between it and small heart too. This is more in your face romantic display with henna art but when you are totally drenched and giddy in love I dont think you should stop yourself from sharing the excitement . When it come difficulty scale part this design is definitely not on the easier side but once you get a hang of shaded henna then it should actually a cake walk. 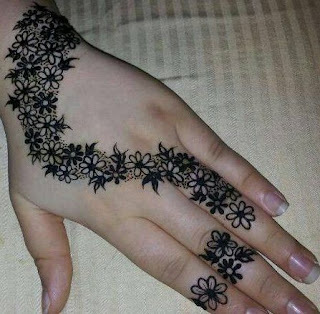 So, practise a bit of shaded henna and simple floral motifs beforehand and this design could be applied even at home. A delicate play of intricate mesh on fingers with tiny motifs like flowers dots and hearts placed between make for a drop dead gorgeous pattern. 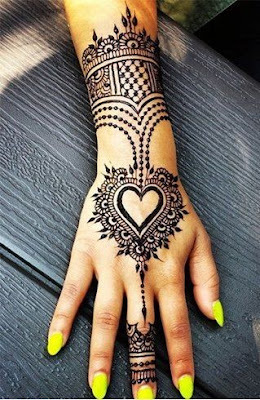 What I love most about this design is how it resembles finger bands giving you a very clean hands look as they are left empty making for a very trendy take on heart henna art. I would totally recommend this pattern for working women who dont want to clutter their hands with traditional swirls and dots but could totally wear a mesh design to work everyday even after the event is finished and gone by. More than hands beautifying the fingers is the hot new trend. This trend is picking up crazy because finger mehndi designs give you a very minimal and balanced look which has a contemporary edge to it. 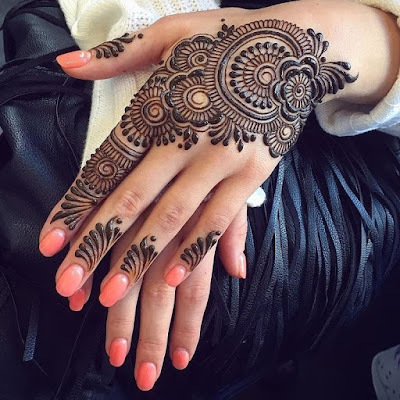 If you are looking to try mehndi designs which are stylish and have a modern touch to them finger mehndi patterns are what you should turn to. 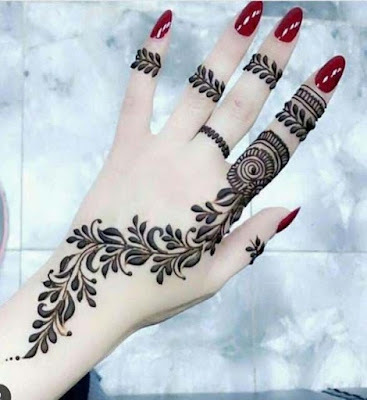 Thick florals and leaves are pretty common in henna art and women love these patterns but getting them applied in a single line to form a finger mehndi design changing the whole design outlook. 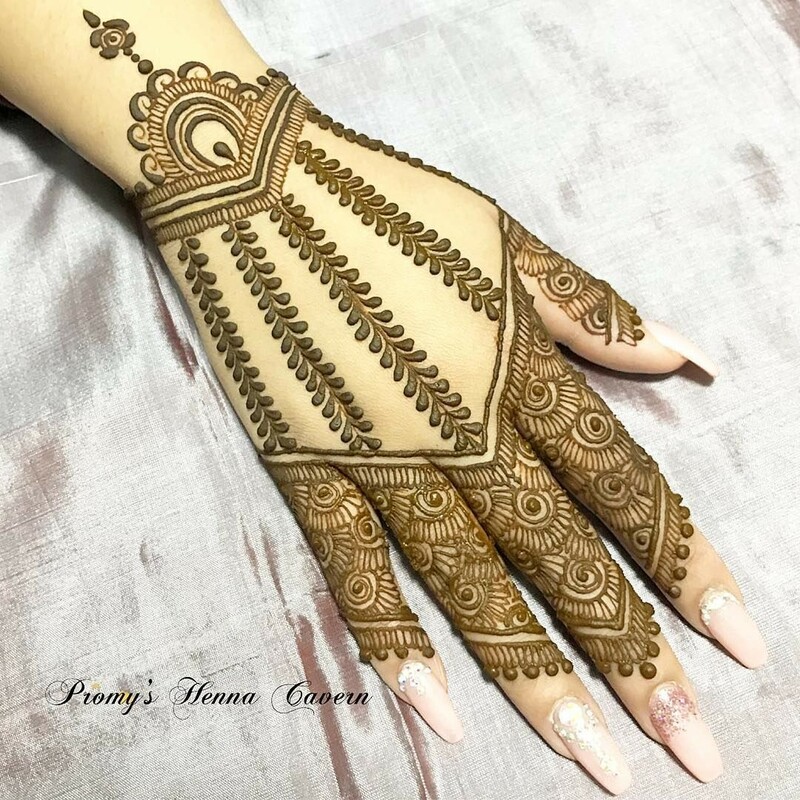 This design has a lot of grace and elegant charm is best paired with huge statement rings on the bare henna less fingers to pop out in a crowd. A very basic pattern any beginner can give a try for a crisp simple pattern. Just draw two simple flowers at a distance and join them up with filled thick leaf rows. For more detailing and visual interest go for leaf rings on other fingers. You know how just one look is enough to catch the attention of anyone? Well this simple yet trendy pattern does just that. 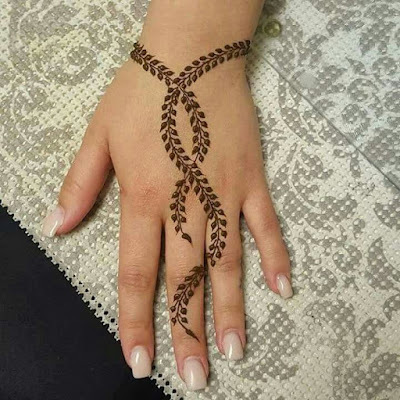 It is inspired from the hand harness and the huge floral motif in the center lends a chic appeal to this pattern which an work at a variety of different events and occasions. 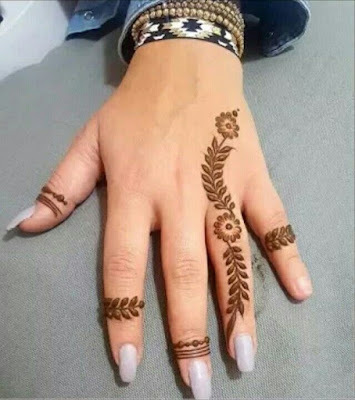 You can try adding more details even to other fingers to give a three or five finger hand harness look to this mehndi pattern. Simple leaf bracelet pattern supported by a half circle and flower with shaded leaves on fingers make for a nice break from your usual henna designs. The dotted diamond motif adds to the beauty of this pattern extending it further down. 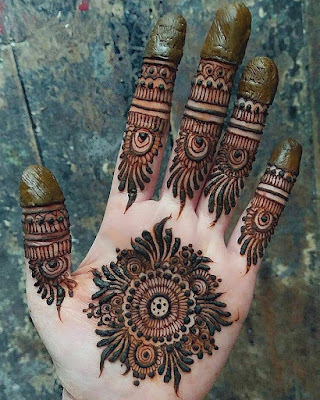 Finger mehndi designs are getting common but this particular design which keeps focus on lower part of three fingers is something really exceptional. Thick dots and swirls form a gorgeous looking pattern which looks absolutely mesmerizing, doesnt it? No one is born an artist. Even if you have gifted talent for an art you need to practise a bit to sharpen and better your skills. 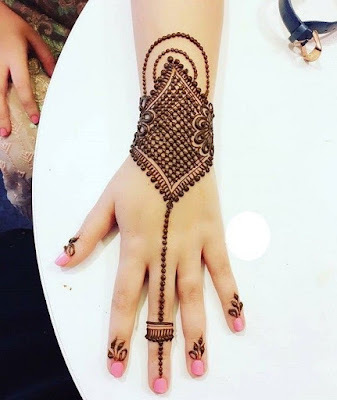 If henna body art fascinates you you can also become an artist and apply stunning mehandi designs and become a star in your family and friend circle. 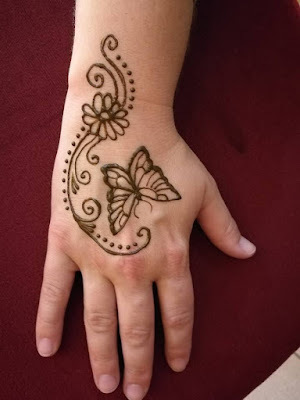 But first you need to practice and it is best to start off with simple and easy beginner friendly mehandi designs. Mehndi designs for starters doesn't mean boring designs. You have to choose smart and opt for creative patterns which are simple yet have a unique look. This concentric circles geometric design is one such pattern which doesnt involve learning many different strokes and yet will look amazing on hands fetching you a lot of complements. Start with a thin cut cone practice circles on a paper and then move on to hands taking your time to get the circular strokes right. 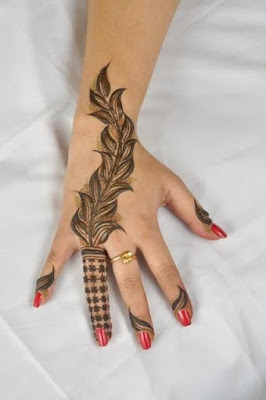 This is a super cool mehndi artistic design which youngsters will instantly fall in love with. If circular pattern is too modern for your taste then return to your roots with this classic traditional design. This design uses a bunch of florals carefully grouped together and a leafy vine extended both ways to elongate the pattern. A floral base leading to trail looks great and is pretty effortless to apply. The design is balanced well with finger ring patterns to make it give decent festive feel. The aesthetics of this design is chic and prettiness overload making for a wedding ready pattern. Floral rows coupled with mesh details make for a stylish finger pattern while lower hand part is left almost empty which just a mandala pattern. This simple arabic mehndi pattern is something all beginners should give a try to hone their skills. Arabic patterns are mostly full hands going way below the wrist area but this design rest completely above the wrist and uses just simple paisleys and shaded florals which can be easily perfected by amateurs. An even more easy and simple pattern to try out is a heart inside heart motif with flowers around for a diagonal design all girls can start out with. This design is actually really small suits kids well so you can easily practice it on hands of little ones in and around your locality. Adorn your hands with statement jewellery like hathphools and rings and apply mehendi on wrists for a change. This pattern uses unique shaped florals and swirls forming a straight sort of design which fits the arms well. Make sure to keep your hands fre of bangles and kadas to let this design shine on its own. Also opt for sleeveless or half sleeve tops which dont cover the design in anyway. This stylishly placed asymmetrical mehandi design is to die for with all its intricate details. If you believe in the less is more trend then well go minimal and go stylish with this unconventional pattern which is sure to draw eye balls even in a crowded room. 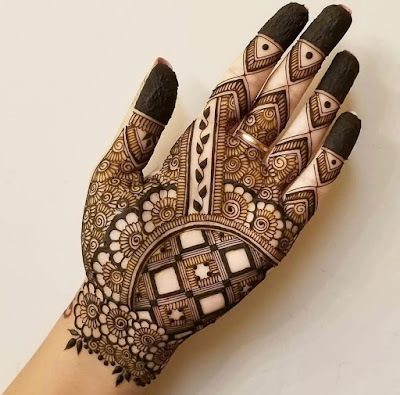 This mehendi design giving an impression of lace glove is a nice blend of tradition and modernity but make sure to get the strokes with perfect neatness for sophisticated look which will make all heads turn over to you. Manadalas have a lot of spiritual and cultural importance representing the universe and make for royal mehndi motifs. If you want something really traditional and minimal mandala is what you should turn to. This mandala is very basic but the finger pattern sets it apart making for a sassy design. A simple mandala pattern extended a bit with leaves and floral booties highlights palms while keeping fingers bare. This design is oh-so-easy to draw and is apt for beginners. 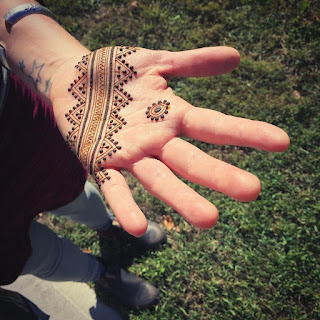 Simple and so aesthetically beautiful this jaali pattern on back hands is funky, fun and oh so unique. Try it if you have a bold personality to flaunt it off with full confidence. Kids can be really fussy and they dont sit for long hours to get mehendi designs applied which is why you should opt for really simple and quick patterns. 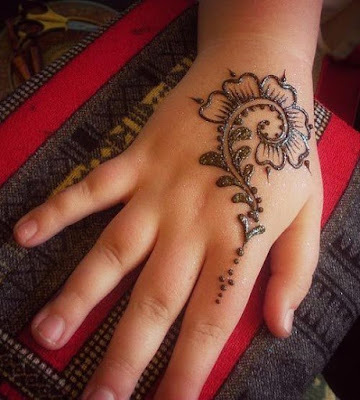 This tikki mehendi design which has thin circles around it with sun like rays to complete it is ideal if your kid is really small. Concentric style half circles on a finger with flower as base is used to bring this finger mehandi pattern to life. The jaali type detail on other finger make it more modish and trendy. This is a classic arabic mehndi design with neat strokes and shaded details giving a very charming mehendi pattern to die for. This pattern is for weddings, try it at your cousin's shaadi or even your friends wedding. This contemporary take on shaded arabic patterns is perfect if you want a blast of colour on your hands with a bit of streamlined shapes and swirls. I love how simple this design is can be extended as much as you want with your own swirl additions. This design is ideal for front hands as the colour contrast will look great on palms and will be an ideal pick for kids at weddings of their mamu's , chachu's and maasi's. A very modish curvy dotted pattern is quick to draw on hands and can further elaborated with floral booties on either sides. A nice pick for children I must say. Pretty yet simle black henna with thick strokes form this mehendi mandala pattern which have thicker finger strokes. An asymmetric pattern which rests on the base of palm is all things elegant and sophisticated yet minimal making it an ideal pattern even beginners can ace. A unique designer shaded pattern drawn across 3 fingers is well complemented with delicate swirl strokes. Gorgeous is the word here. A super thick swirls and leaves pattern is very intense and bold and works well for front of hands at any special occasion you desire. All we women love accessorizing our looks and beautifying ourselves with statement jewellery pieces. 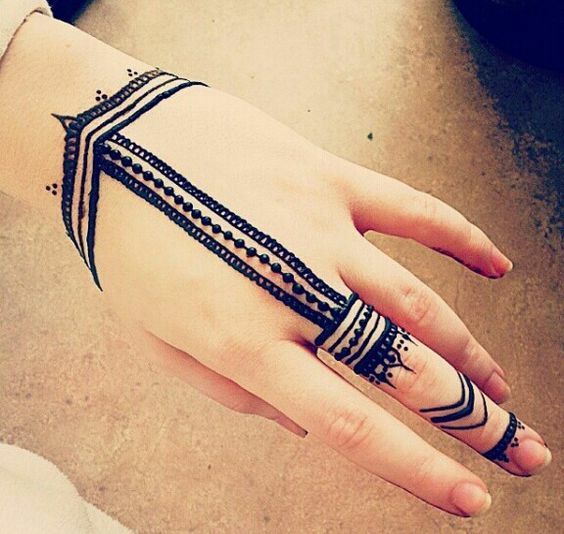 Jewelry on fingers, arms, wrists, feet, neck look uber stylish but have you tried trying jewellery inspired henna patterns yet? 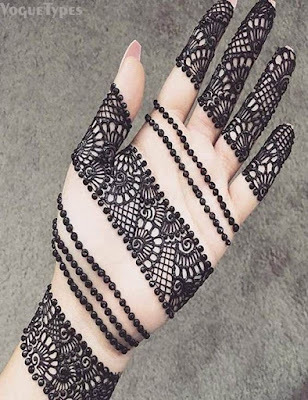 These all new jewellery mehndi designs are chic and and a very unique way to flaunt body art. 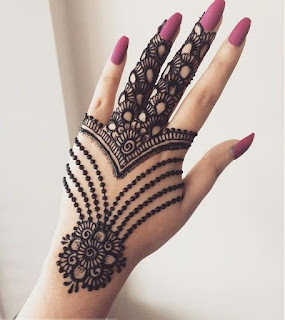 You can go bangle style henna, hathphool inspired mehndi patterns or finger ring style designs, all look stunning and is sure to grab eye balls at any event you attend. 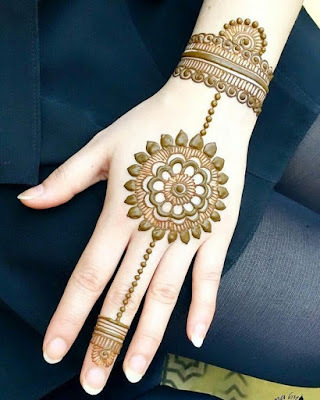 Here I bring to you some real pretty yet simple mehndi designs which look like real jeweller. exited? Scroll on! A five finger hathphool is what most brides wear on their wedding day. This kind of hathphool jewellery can look really over the top if worn by non-brides. 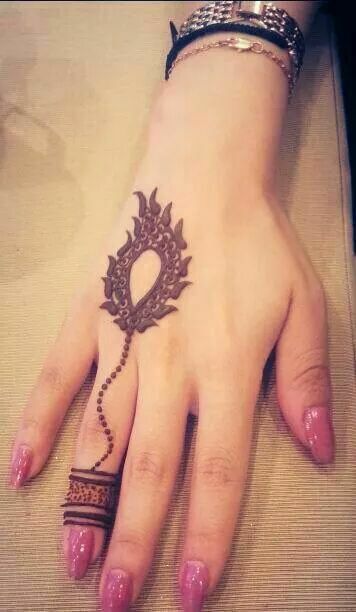 If you love hathphools you can still flaunt a variation of it by going for this new jewellery mehndi designs at any event not just weddings. I suggest you keep all kinds of hand jewellery when having this pattern on so that this new design can make a statement of its own. If you really want to wear hand jewellery then opt for a different design on your other hand and add rings and bangles on that hand. Unlike the five finger hathphool single finger hand harness is something any women can flaunt irrespective of her age and occasion. 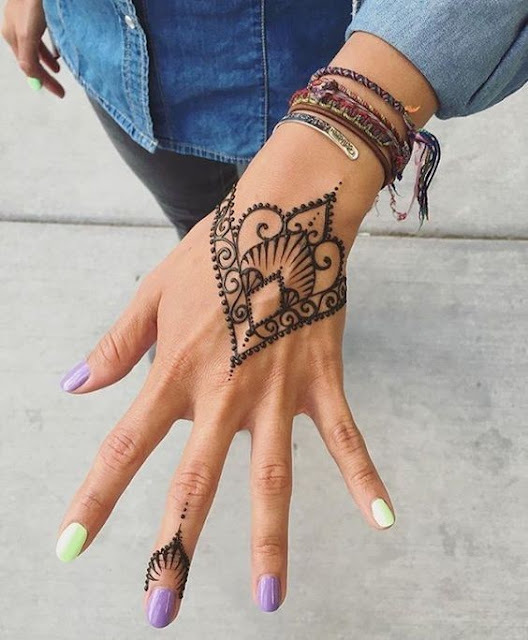 But if you want to skip jewellery and stick to traditonal body art then do give this chic and stylish simple mehendi design a try. It is actually really simple to apply with just checkered details and dotted lines. 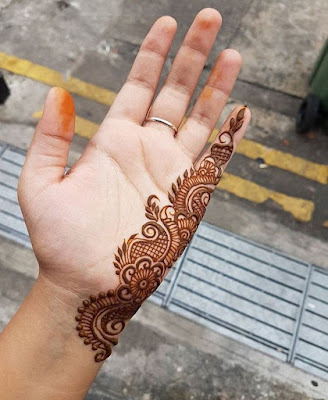 you can apply this henna pattern yourself if you have some basic henna application skills or just get it applied from siblings or friends who are beginners. For more festive occasions like weddings you need more elaborate patterns like this floral line. 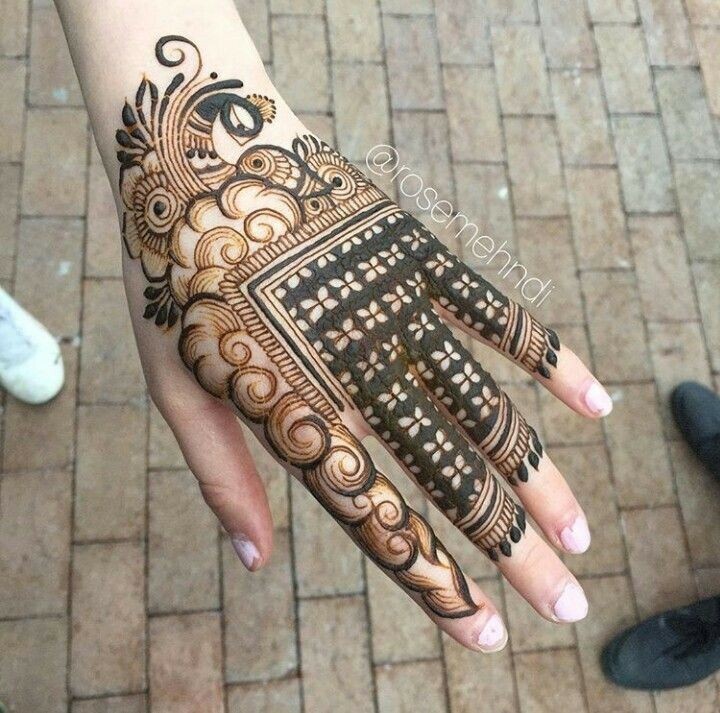 I love how this simple arabic mehndi design looks complicated but is actually very easy to apply. 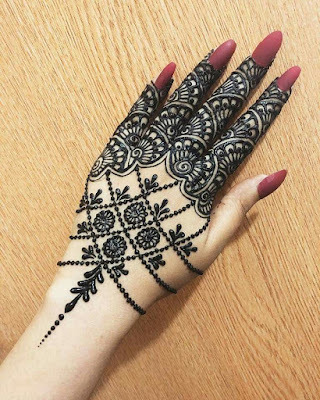 Shaded mehndi designs are the latest trend on block and this trend is getting very popular because shaded patterns look really exceptional and bring out the henna dye better on hands. This lotus pattern is simple, minimal yet royal enough to be adorned on brides making it a sensational wedding mehndi design. If you are a beginner dont get scared off with the delicate appeal of the lotus pattern, just this shaded lotus a bit on paper and everything else in this design is easy to master. 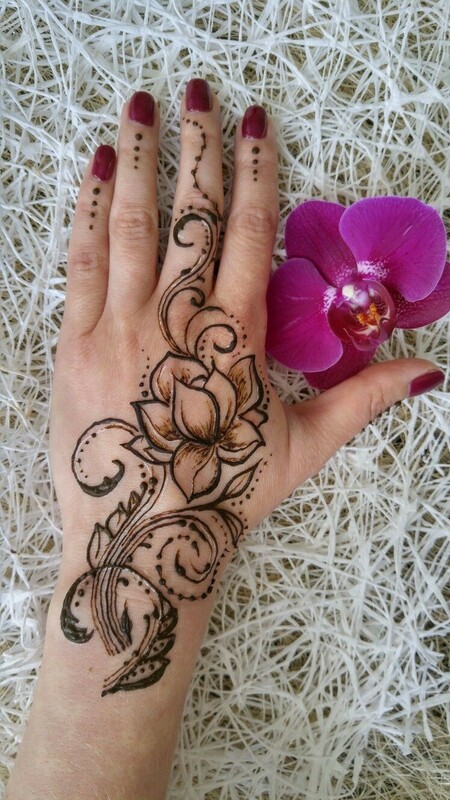 If you find it difficult to draw the lotus just replace it with a different simpler flower motif and viola a super amazing yet simple mehndi deisgn for beginners is ready. 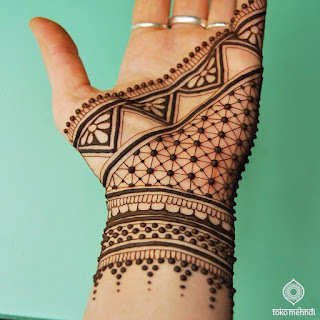 If you find mandala mehndi patterns a tad bit too simple then try this over sized mandala inspired design which extends the mandala a bit on both the sides of hand making for a really pleasing sight. you can add your own creative strokes in this design and extend it a bit more or just leave it as is and work on some swirls to beautify the fingers. If you want a simple indian mehndi design then opt for a circular flower motif combined with other motifs for a multi patterned henna. 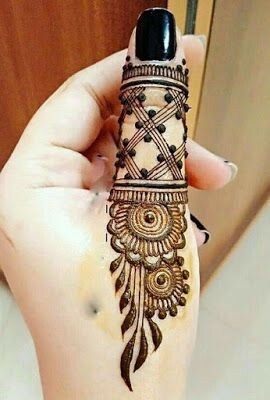 Use a thick cone to bring this kind of design to life so the whole strokes stand out better when the mehndi has been removed and only colour remains. You can try this simple henna pattern on both front or back hands at any traditional event of your choice. If you like work on your fingers opt for this half floral pattern with focus resting on your fingers. 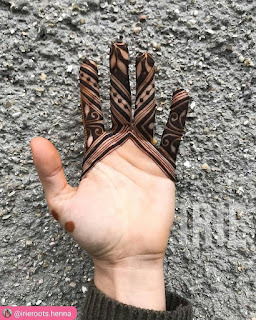 This a clean and a very easy to apply pattern which is ideal for beginners to start out their henna art learning journey with. Most traditional mehandi patterns have a peacock motif in it making for an attractive design but this particular design has an entire peacock drawn all across the hand. The whole peacock with its feathers and swirls gives a uber classic and regal feel making it a great design to try at more traditonal or cultural events. do you have thing for both indian and arabic mehndi designs? This design is an amalgamation of both styles and is bound to look beautiful on anyone's hands. If you want go bit more simpler you can reduce the amount of patterns on fingers by keep some fingers bare and this pattern will look just about fine even then. 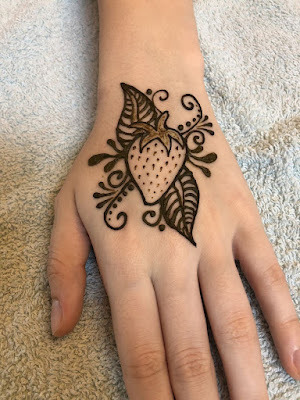 New to mehndi application art? Start of with simple mehandi designs which resemble permanent tattoos to hone your skills well before moving on to complex patterns. This design has more edgy hip vibe to it and will suit young women better. 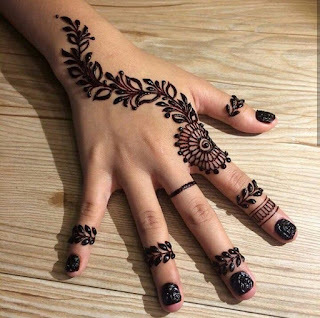 Also since this design has a tattoo type of vibe make sure to keep henna longer on your hand to get a deep dark blackish brown colour. Simple and sober design which can be tried at home even by amateurs. though this pattern has been drawn on back hands I have myself tried patterns like on front hands and it looks very beautiful. 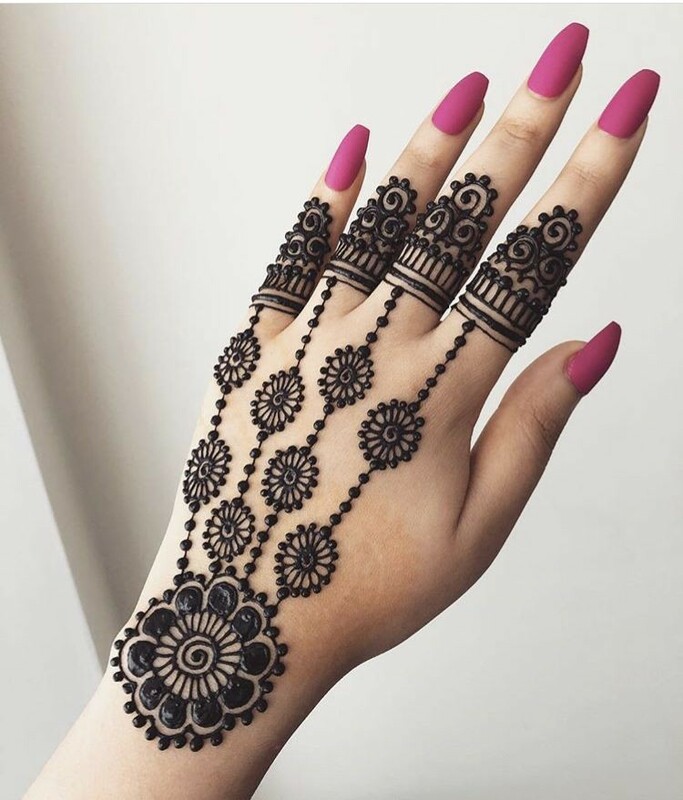 This unique and effortless design suits the modern young women well who want a mix of trends and traditonal styles in their henna patterns. I just love jaali mehndi designs and this lace glove inspired finger mehndi design is all things lovely. Thin mesh detail covers two fingers which then have lots of tiny rose motifs giving a chic look and two big swirls form the base with half mandala style flower. 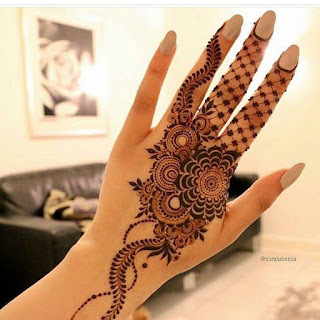 If you want to try some minimal finger mehndi designs this season, this is a nice gorgeous pattern to begin with. 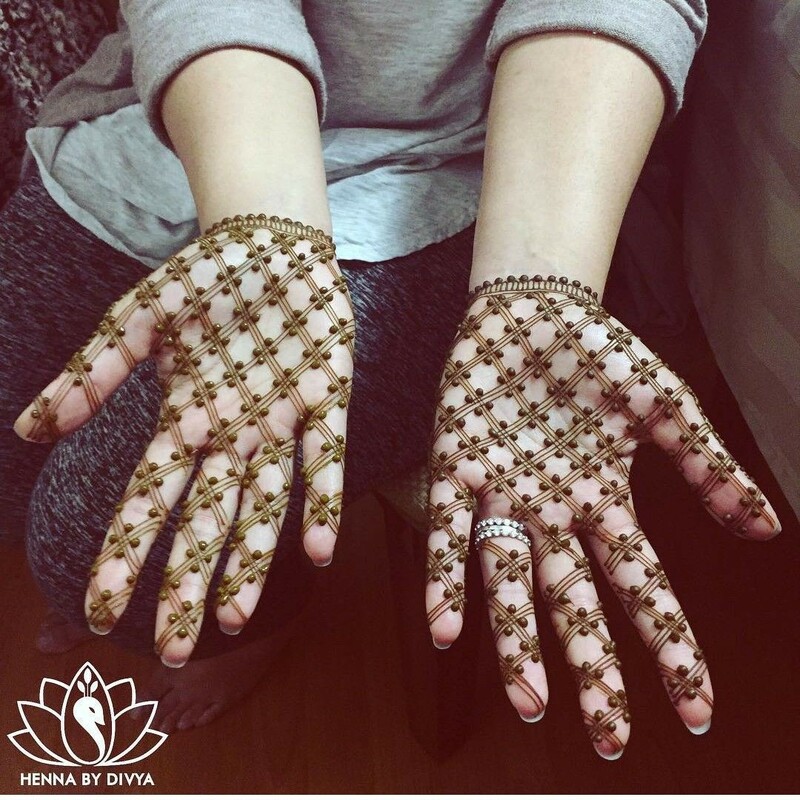 A matching mehendi design on both hands with complete checkered details filled with tiny dots makes for a captivating vision. This design though contemporary can be worn at wedding receptions of someone close like a friend or sibling. The best part about this design is anyone can draw this pattern without much difficulty and it wont even look like a work of beginner because the uniqueness of design steals spotlight and attention away from the simplicity of it all. 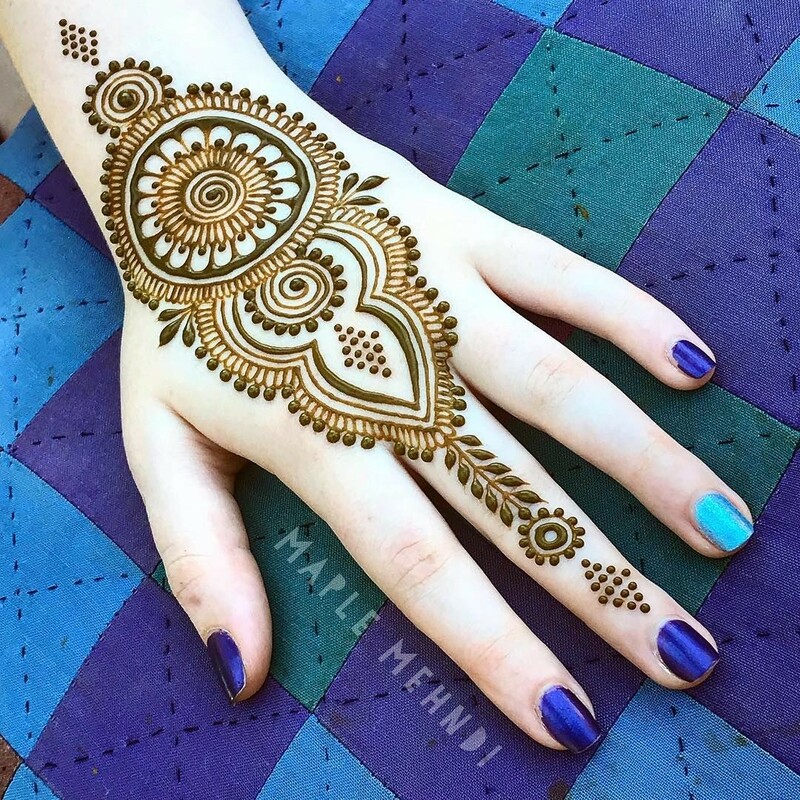 For a fun and hatke take on henna leave the fingers and top hand part bare and go for a heavy pattern all across the arm. This henna pattern is very striking and it is sure to grab eye balls but make sure to avoid kadas and bangles which can give a cluttered look with this mehndi design. 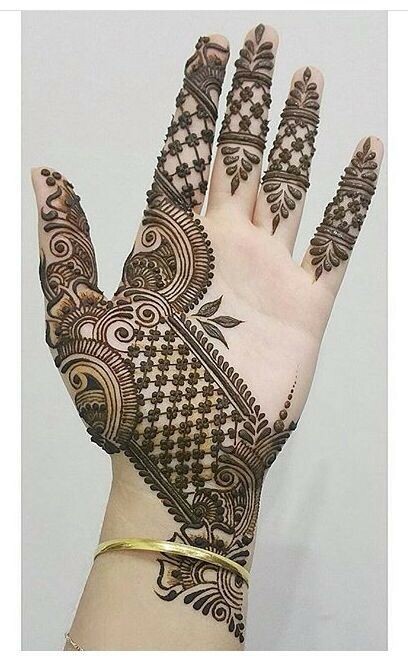 Total bamboozling stuff is what this mehandi design is made of. It is unique and yet simple to apply giving a full hand front hand design. This design isnt for those traditional occasions but when you are in the mood to try something really creative and hatke give it a try . This is a very delicate and chic pattern which will be loved by ladies across the globe as it is a very universal sort of a pattern. Thin strokes are used to form swirls and a huge lotus flower in the middle and then some strokes are thickened and flower shaded a bit to give more definition and structure. This design is all grace and sophistication suiting western events and ceremonies better than traditional occasions. Christian brides can choose this design or it can be applied on global events like new years eve, valentines day, Christmas etc. This lovely half and half mehndi design with loads of empty spaces was actually applied by an Indian bride who chose to go the minimal route. 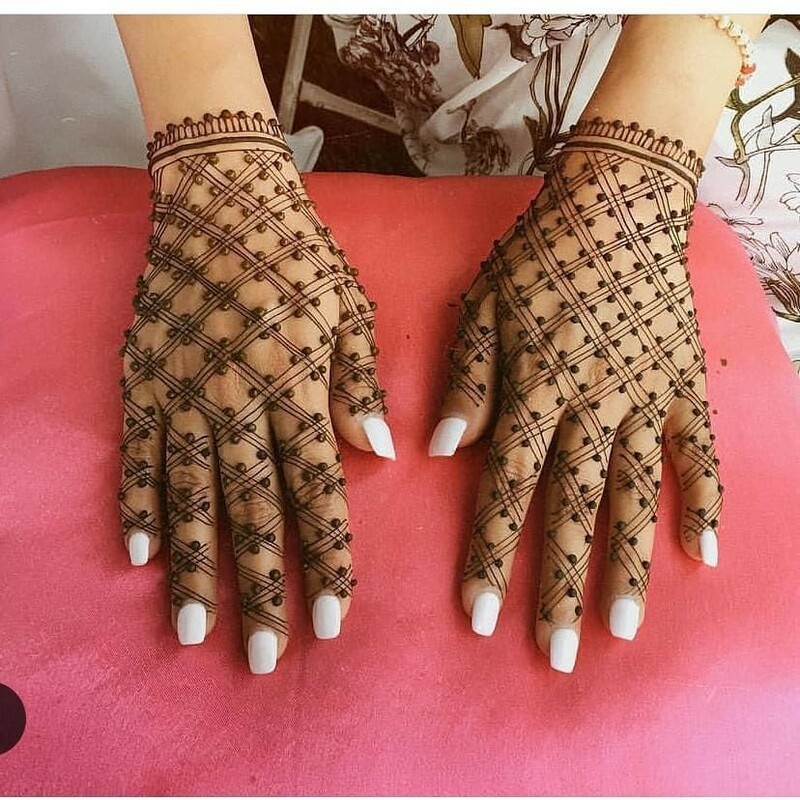 I must say a very bold choice in a culture where brides are encouraged , forced even to apply full hand heavy bridal henna patterns. Your wedding is a special occasion where you weave a lot of special memories and if you dont want to spend hours together getting henna applied then it is totally fine. Get a basic minimal design like this applied from a friend or a cousin and enjoy your day bonding with your loved ones before you begin your journey of martial bliss. 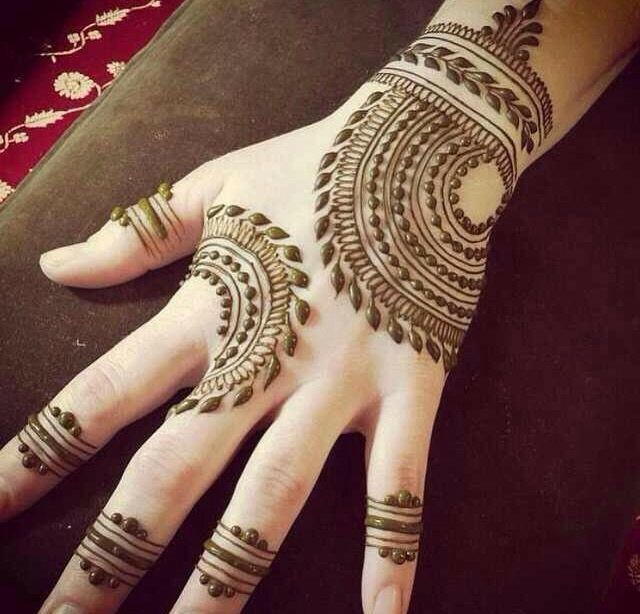 To Make a statement you dont need to go all out and learn complex full hand mehndi patterns . 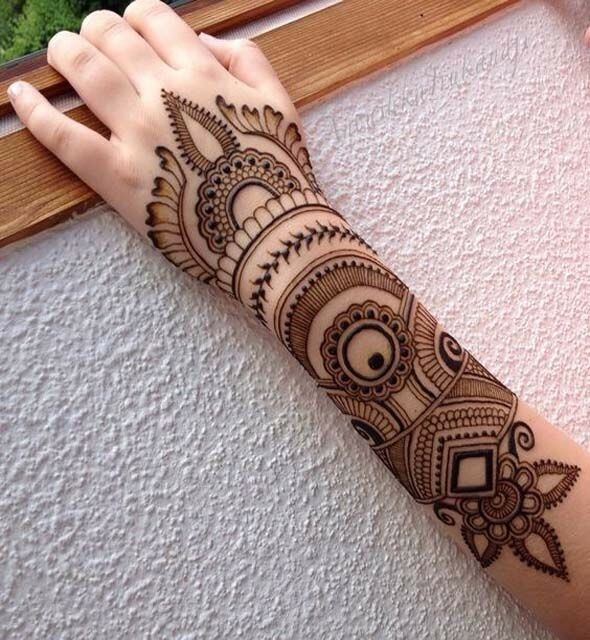 Even simple single line henna patterns can look good. If you are a beginner I suggest you start off practicing single mehndi designs and then move on to full hand patterns . 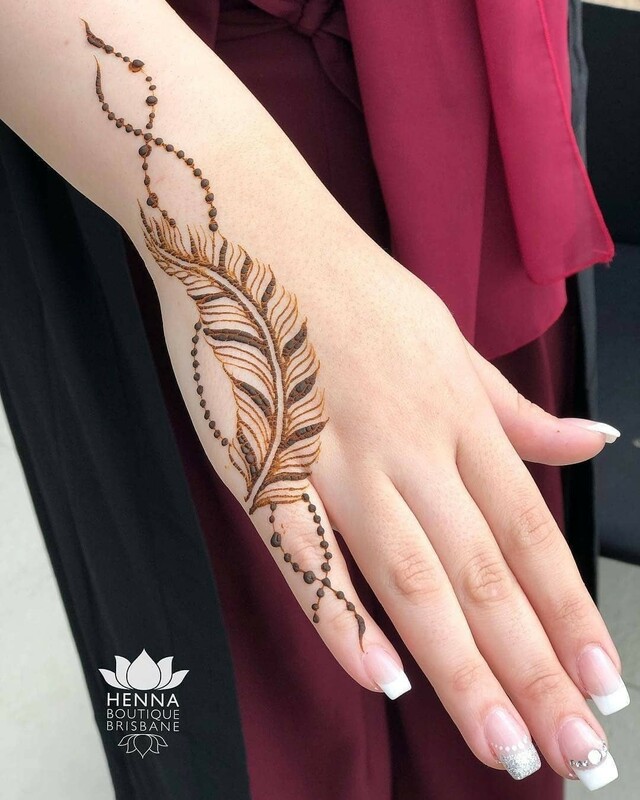 Another very simple yet gorgeous artistic henna pattern which uses just shaded leaves combination for a captivating charm. 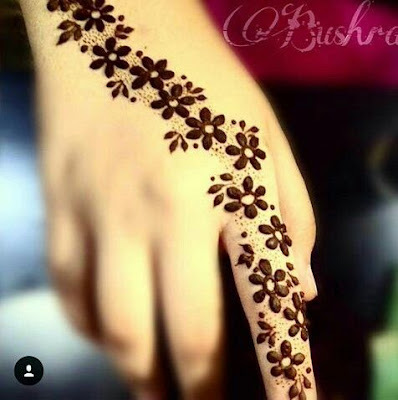 Since this is another single line mehndi design the rest of fingers are left bare giving a very clean and finished back hand mehndi look. This design is suitable for women at simple occasions like dinner parties or rakhi and valentines day. This design is super simple and there is neither flowers not leaves to complicate things. The fous rests on a single finger which a ring band is applied and then a dotted swirl connects to a feather like motif. This back hand mehndi pattern can complement full hand front mehndi designs beautifully giving balanced festive look. 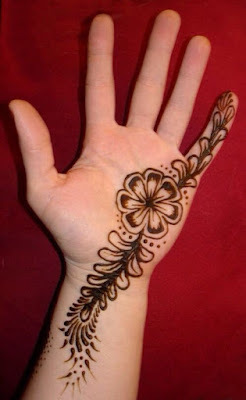 Avoiding traditional motifs of henna you can go for a really different pattern with a single tulip inspired flower as base focus which is then connected to the fingers with a dotted line. Fingers has some nice swirls patterns going on but the real beauty of this pattern is the fully covered shaded flower, so take note to get the shape right if you are a beginner. This clutter free design is girly, chic and very contemporary suiting the younger brigade best. 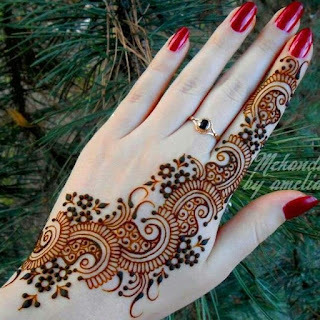 A basic finger mehndi pattern is all you need to enhance the beauty of your hands. This mehndi style looks like an over sized statement ring and used a mix of some thick and thin strokes keeping all other fingers bare. If you want an unconventional design yet keep it simplistic then this geometric inspired hathphool pattern is great pick for you . This single line henna pattern starts at the wrist area giving an illusion of bracelet and then across the middle finger form a ring like motif giving a innovative back hand design. 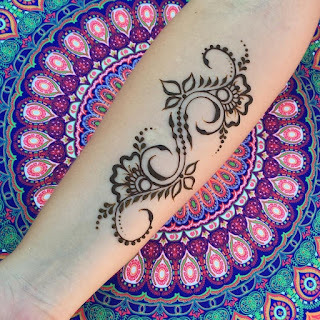 This is a very striking henna pattern which also pretty easy to apply which means you can do this at home. use a thin cut cone to draw multiple small flowers in a swirl pattern and then go about shading some flowers and leaving some non shaded to give a beautiful contrast type of effect making for a gorgeous festive simple mehendi pattern. 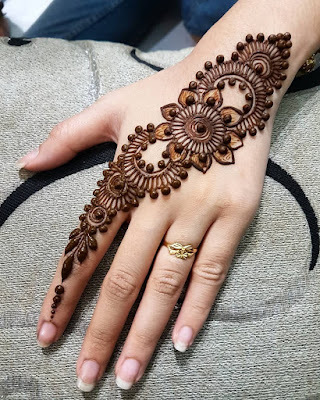 For a simple yet a long trail kind of mehendi design just use thick multiple thick shaded flowers beginning from a finger and extending upto whatever length you desire. 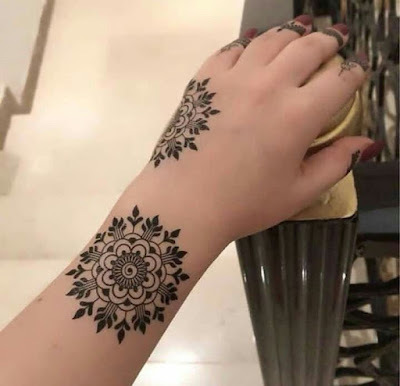 You can go up to arm or wrist length with this pattern and it will not look cluttered or over whelming because it is a single line mehndi design. after you are done with flowers add some shaded leaves and tiny dots to the mix a very eye catching drool worthy design is ready for your flaunt. Women in the middle east also have a very deep connection with henna as Prophet Muhammed SAW (pbuh) also encouraged mehendi application in women. Prophet also used henna as a hair dye so, it is regarded as a sunnah. 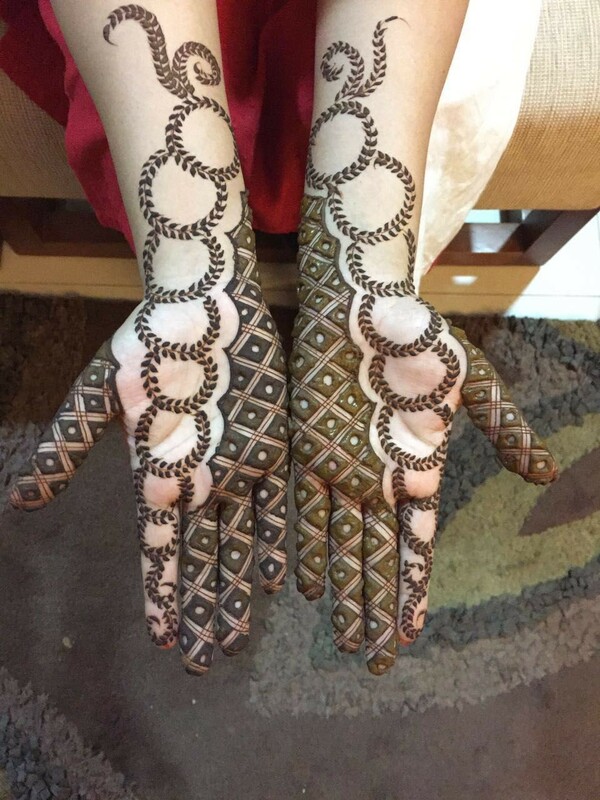 Islamic brides also get mehandi applied before nikah ceremony. The cooling sensations of henna help calm and destress nerve ends which are present on feet and finger tips. Henna also has a pleasing smell which coupled which rich alluring colour acts as an aphrodisiac helping boost romance in newly weds. Wash your hands nicely with soap before application. Avoid applying any creams or lotions to hands as it many interfere with henna penetration into skin. 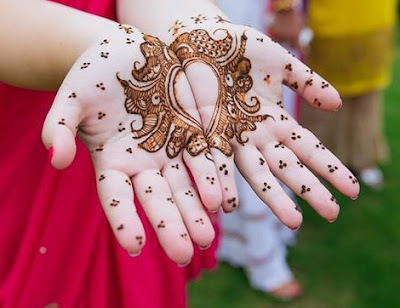 Use good quality henna paste and cones: The colour of your henna mehendi also depends on the kind of mehendi you have used. Good quality organic henna gives gorgeous deep reddish brown colour. 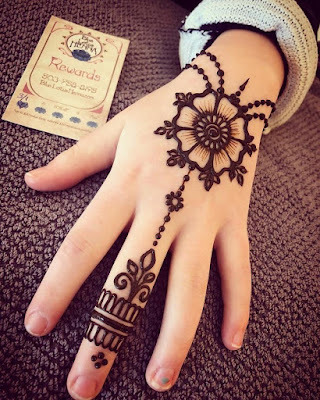 So always spend a bit and buy quality and authentic pure henna powder or cones. Many henna cones these days comes mixed with eucalyptus or peppermint oil which helps enhance colour, even these are good options. Let the henna pattern sit on your hands 5-6 hours: The longer the mehndi paste stays in contact with your skin the darker it becomes so it is best to not wash off the mehndi design for atleast 6 hours. 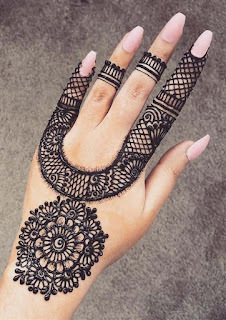 The best practice actually is to apply henna after all household chores have been completed at night and sleep with mehndi laced hands allowing the henna to stay on hands for about 10 hours. This is a tried and tested method i have personally used and it has always given me guaranteed dark results. 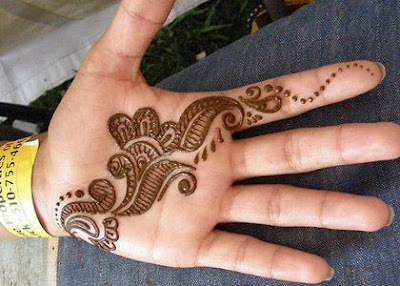 But make sure you are using pure henna as chemical mixed henna can react with skin if left for this long. 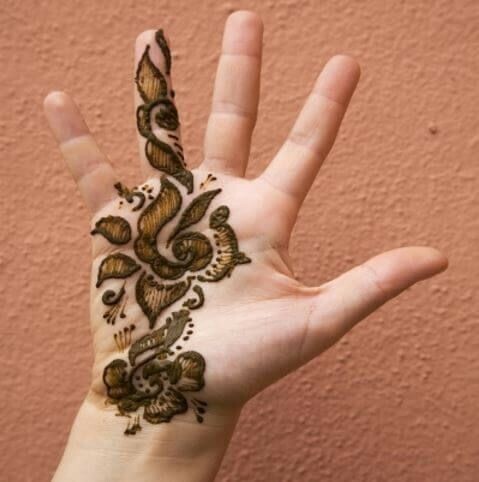 Apply sugar and lemon juice mixture : Dried henna can easily fall off reslting in dull coloured mehndi. Prepare a mixture of sugar, water and few lemon drops. dab this mixture ligthly using a cotton ball on your henna design after it starts to dry up. This helps henna stick to your skin. 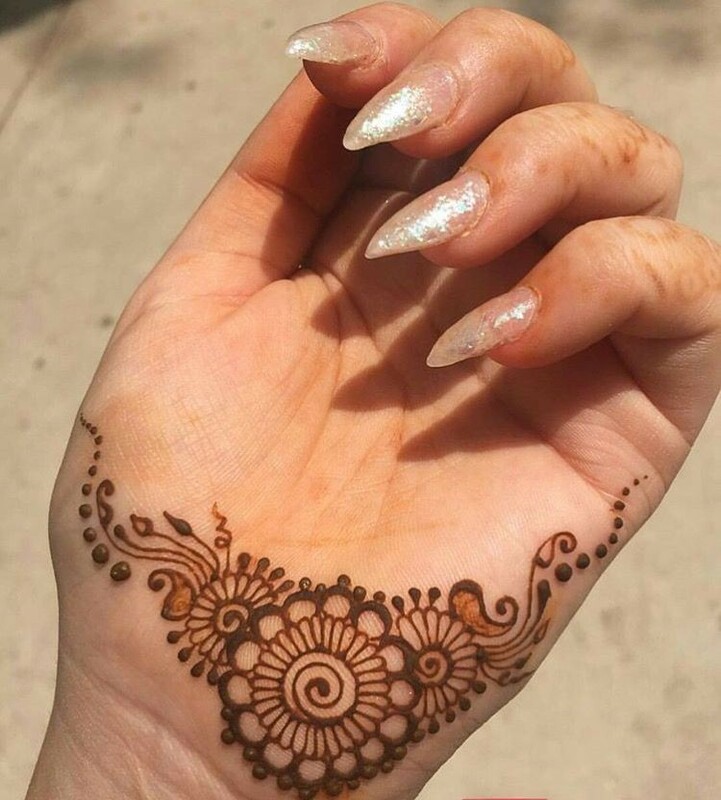 Make sure cut your nails before henna application. Nails cut after mehndi application look weird and discolored ruining the whole aesthetic appeal. Shaving and waxing if needed should also be done before henna application. 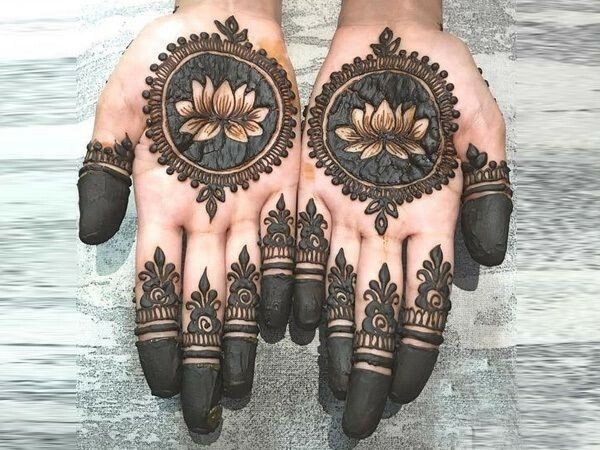 Cloves can help darken mehendi colour: After you have removed mehendi from your hands put 6-7 cloves on a pan and let your mehendi laden hands absorb the fumes. You can even apply pure clove oil if you have as an alternative. Many women at my native place also apply vicks vapour blam which is also a good idea if you are not comfortable with clove flames. Apply mehndi well in advance: Mehndi colour darkens after removal so make sure to apply it atleast 2 days before the actual event. Even brides need to plan well and have their mehndi function two days before their wedding.